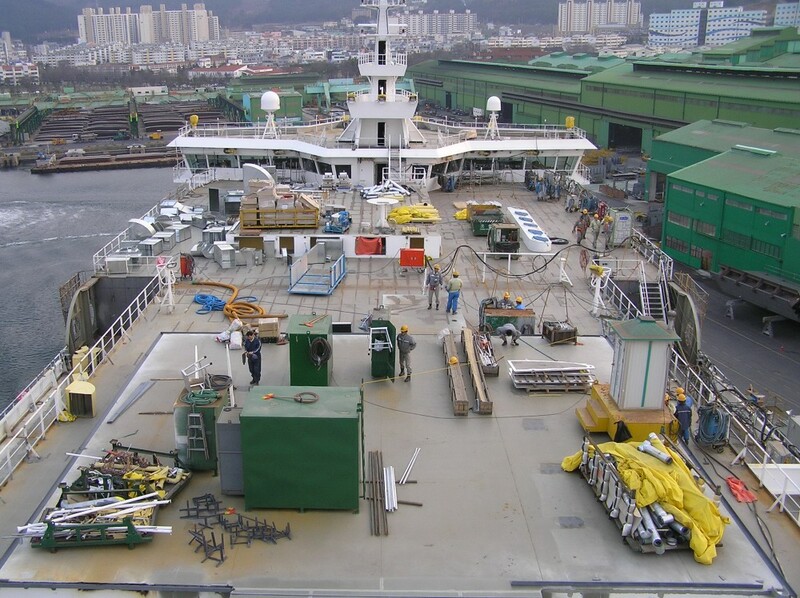 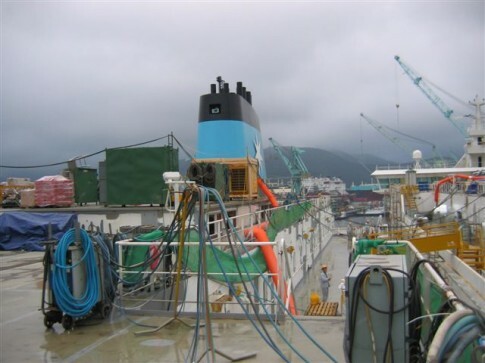 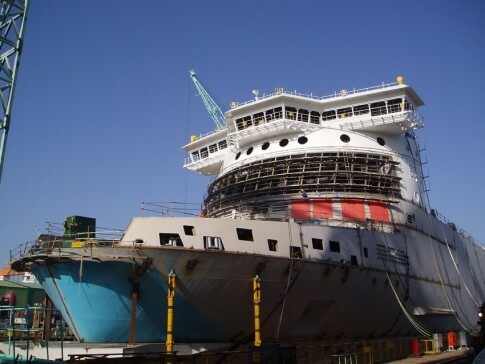 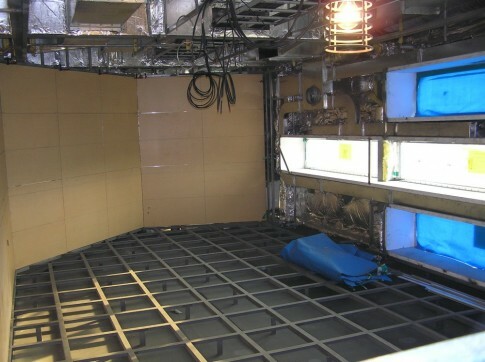 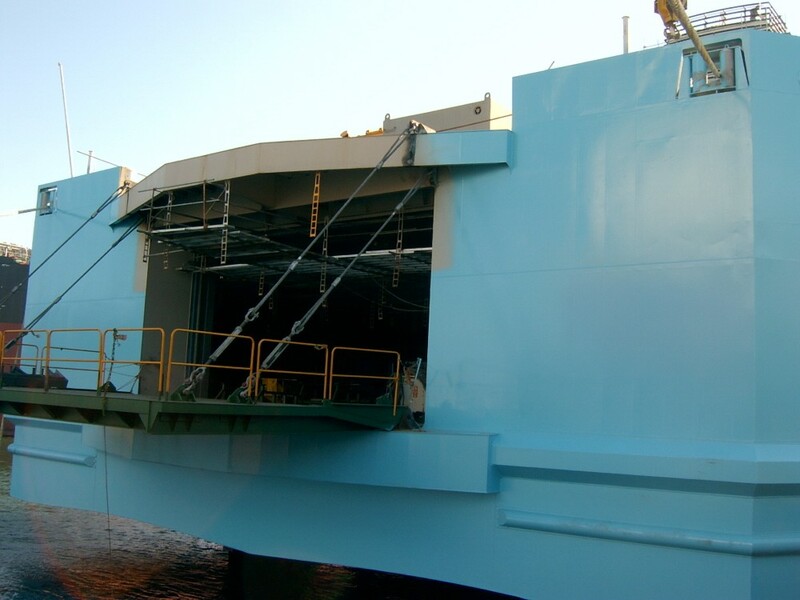 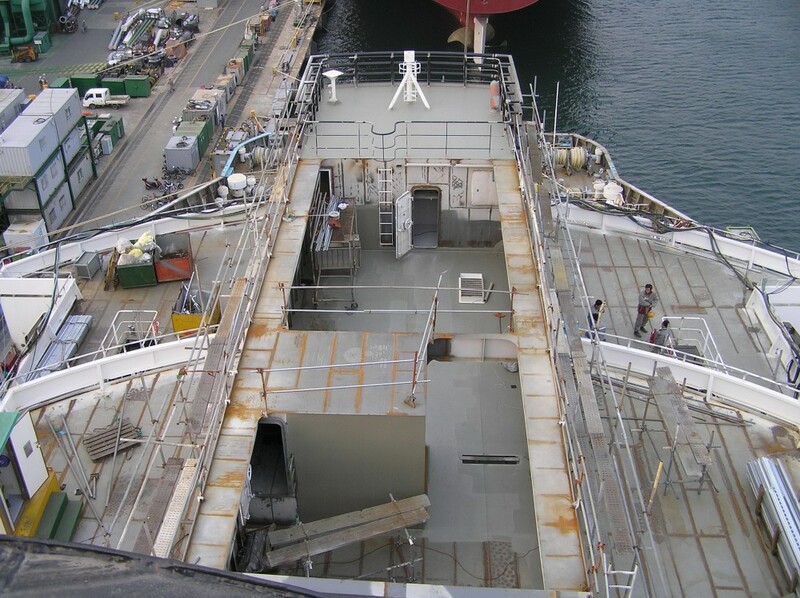 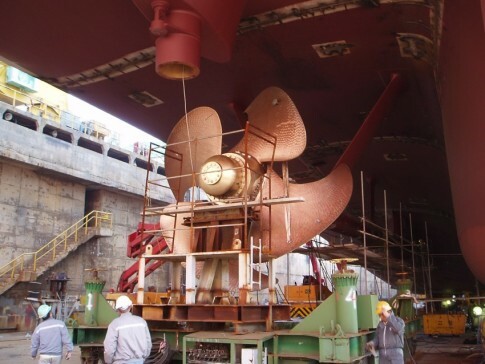 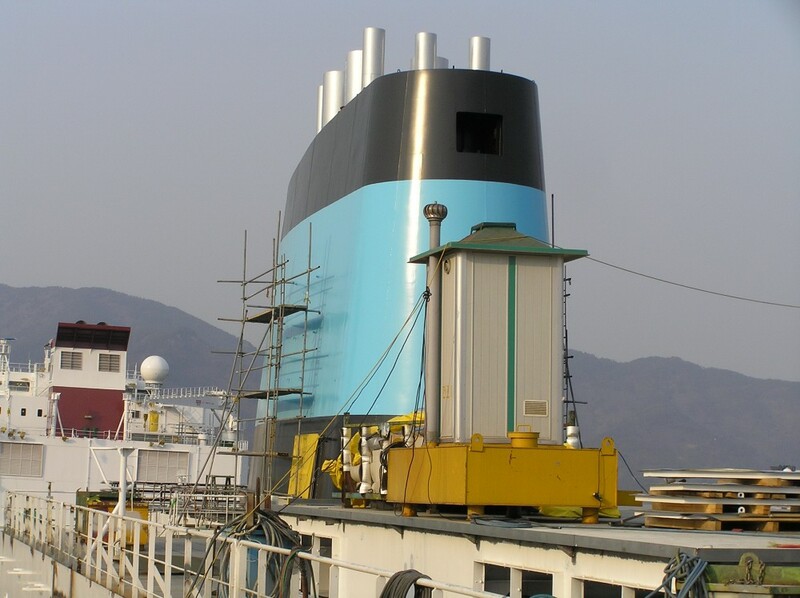 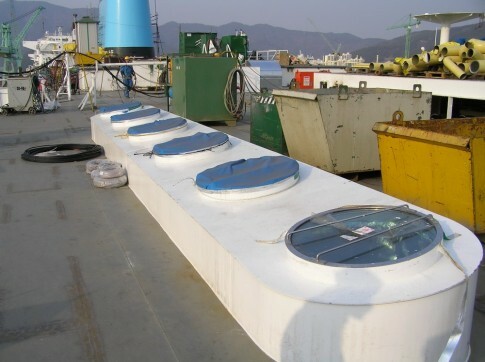 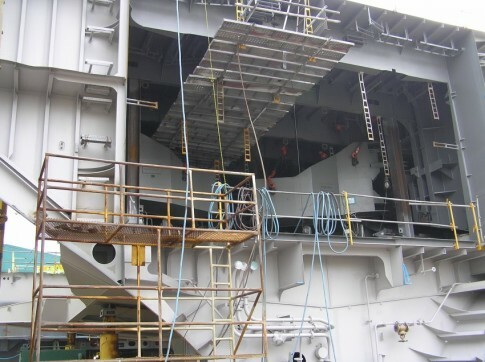 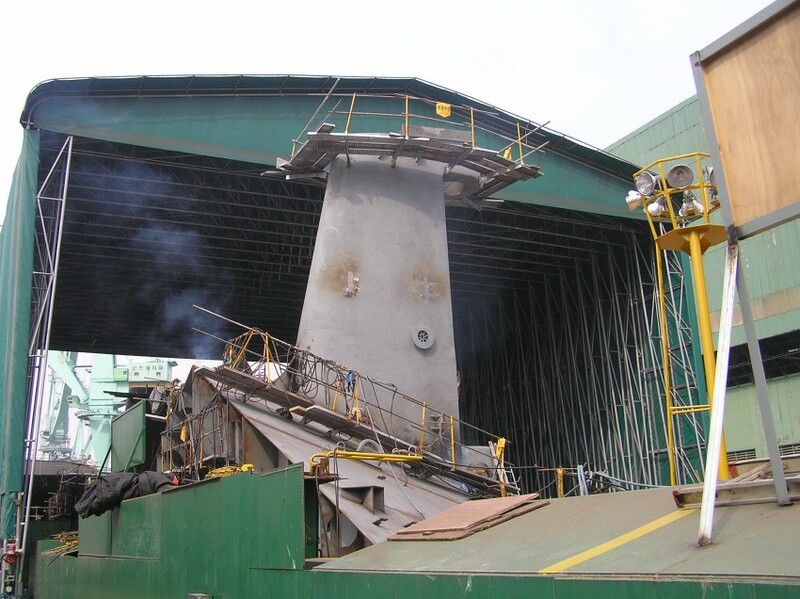 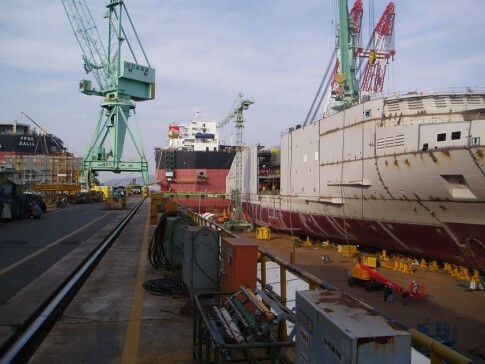 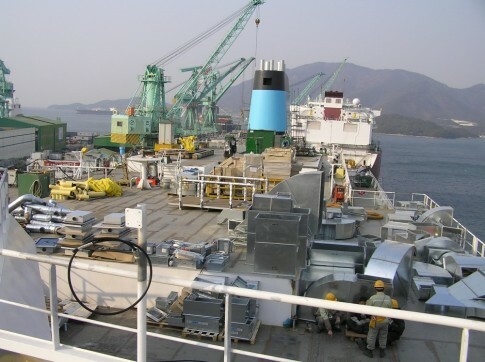 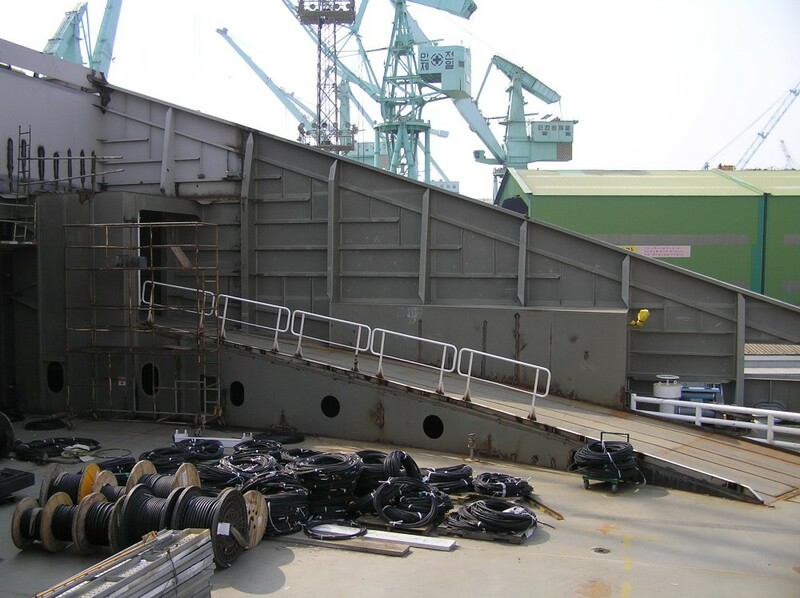 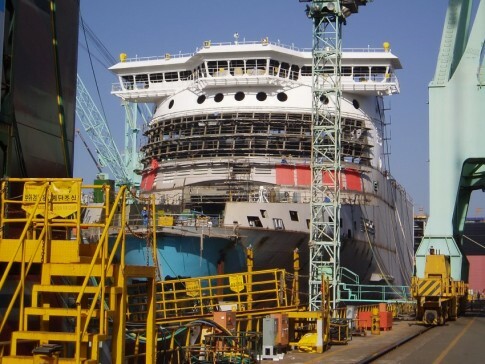 In this final part of the review of the construction of Norfolklineâ€™s â€˜Dâ€™ Class, we move upstairs inside the Maersk Dunkerque in mid-2005 as the interiors of the ship were assembled at the Samsung shipyard at Geoje in South Korea, prior to handover to her owners that September. 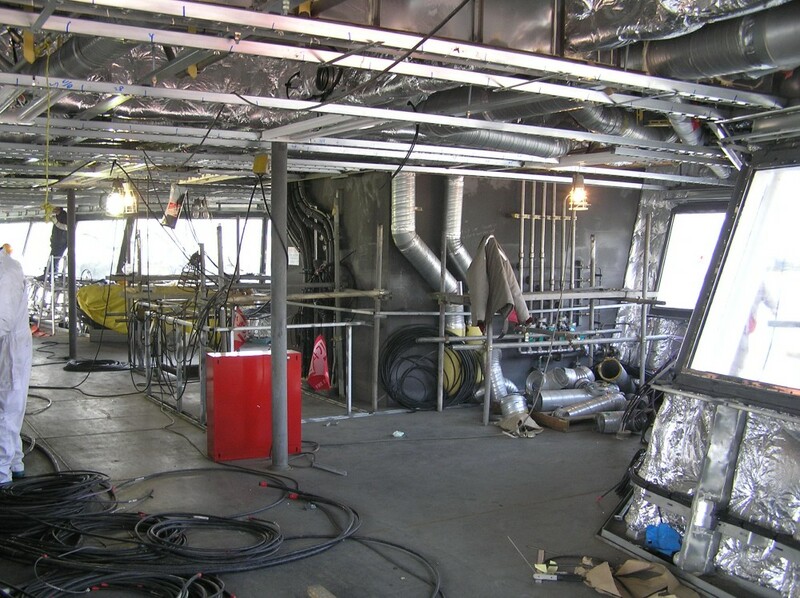 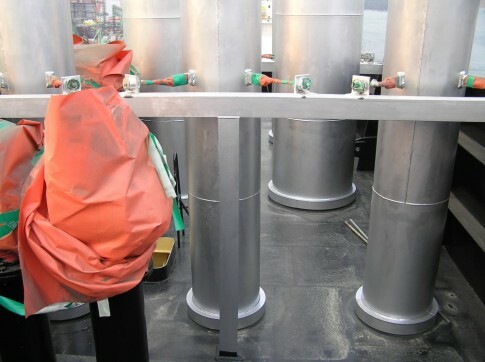 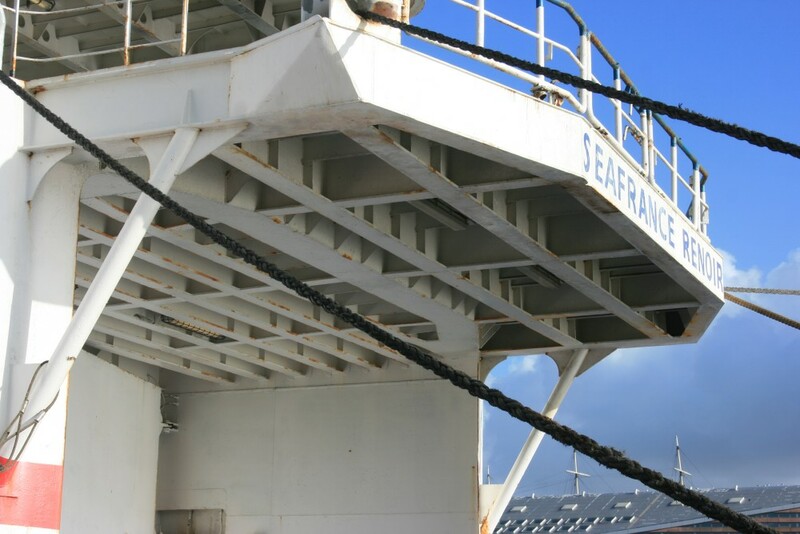 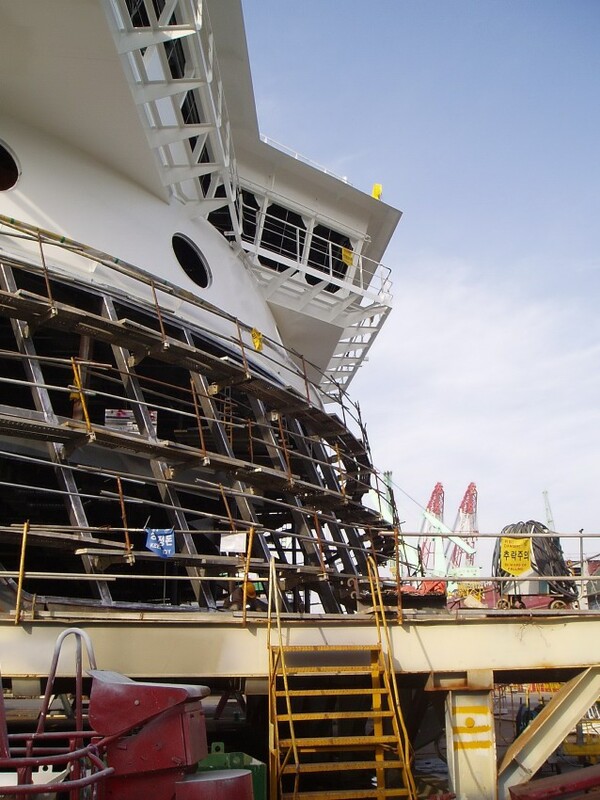 This post covers the upper of the two main passenger decks â€“ Deck 7 – and some of the crew areas. 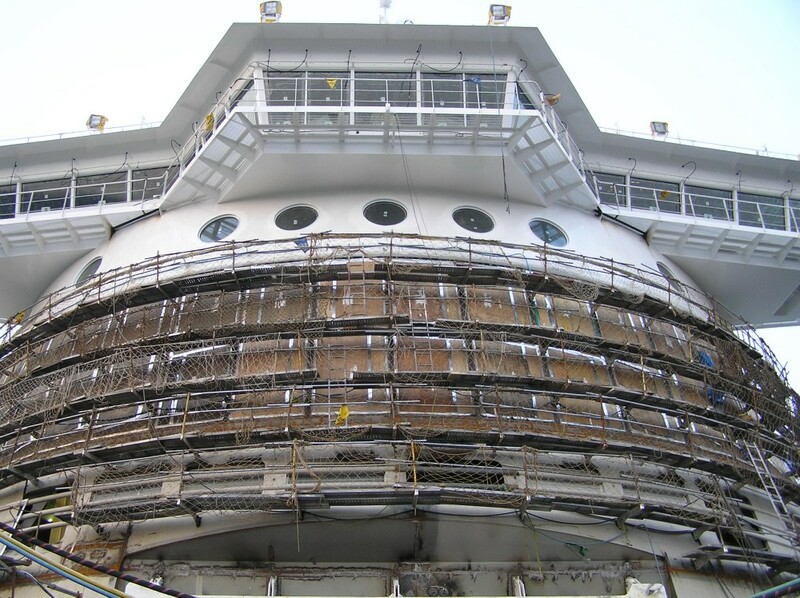 To give a feel for how the ship looked as completed, the under construction images are paired with equivalent pictures from on board the ship and her two sisters in service on the English Channel. 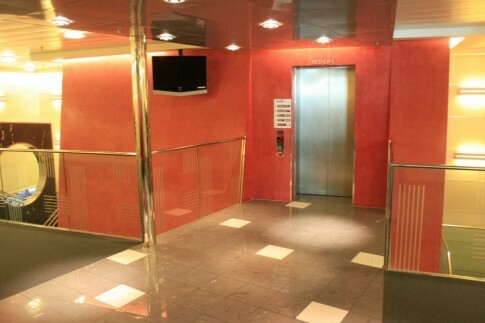 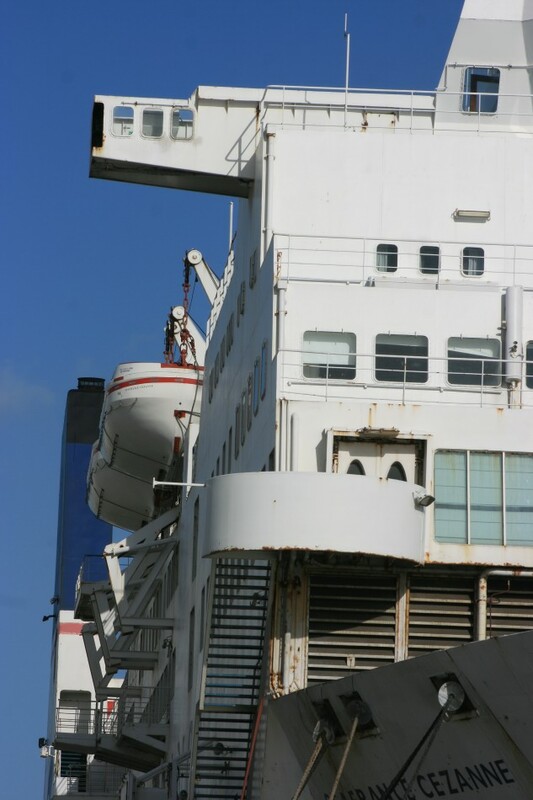 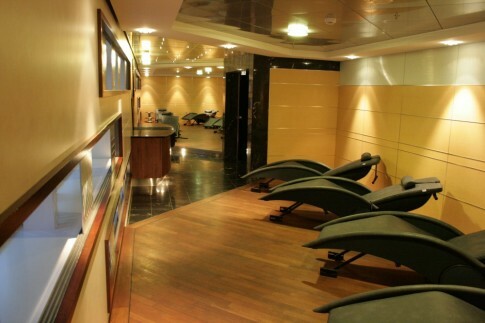 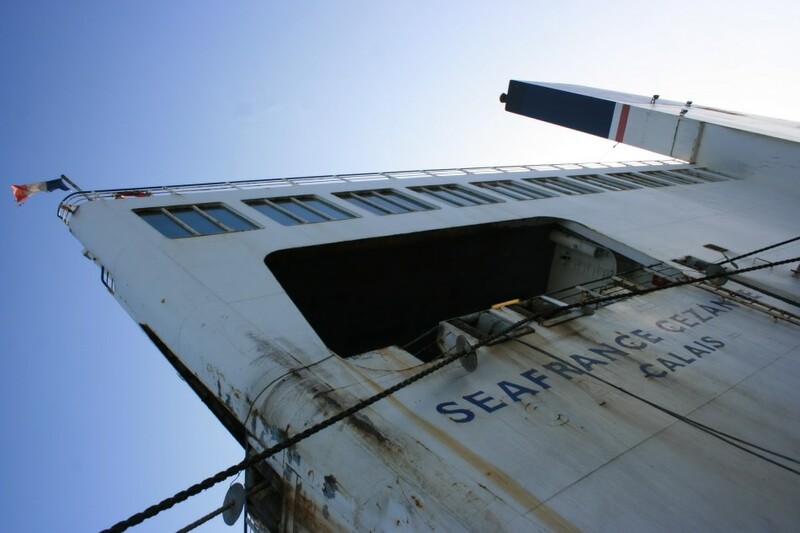 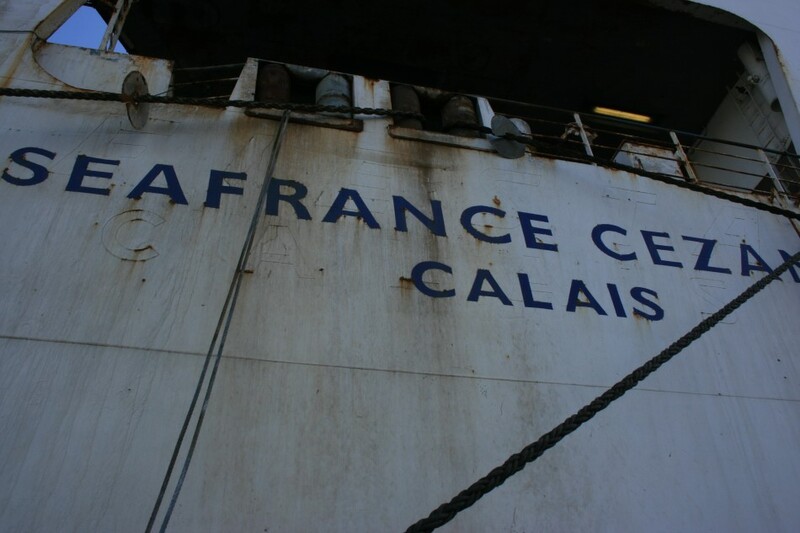 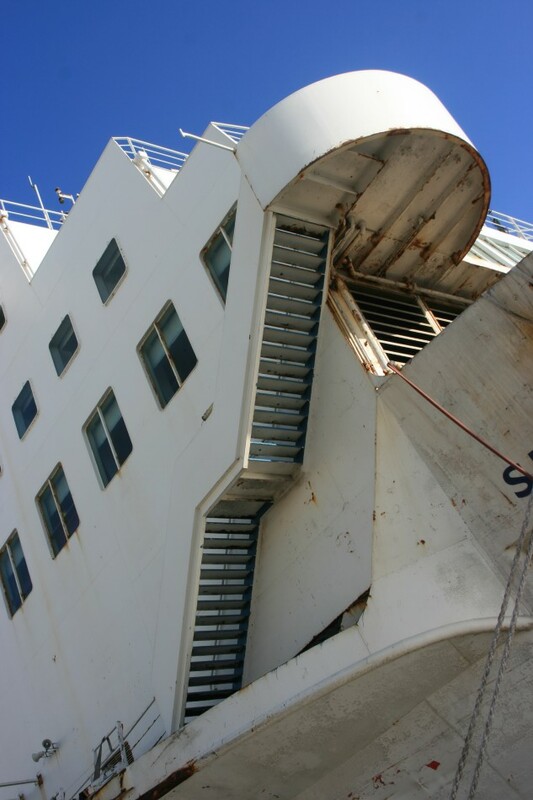 Click here for an on board guide to the ships showing the arrangement of facilities. 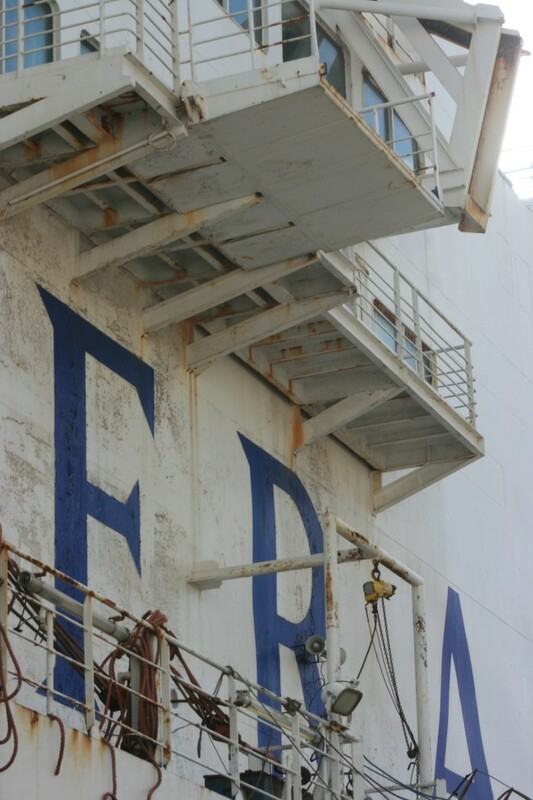 Right forward, in the prime position on Deck 7, are the 'Road Kings' areas, exclusively for the use of freight drivers. 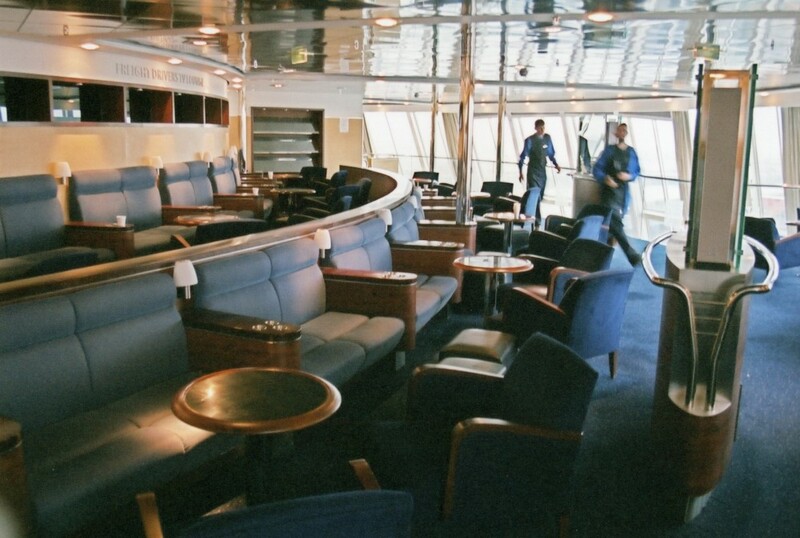 'Road Kings' consists of a cafeteria to port, a separate lounge forward to starboard, with a 'Relaxation Lounge' just astern of the latter. 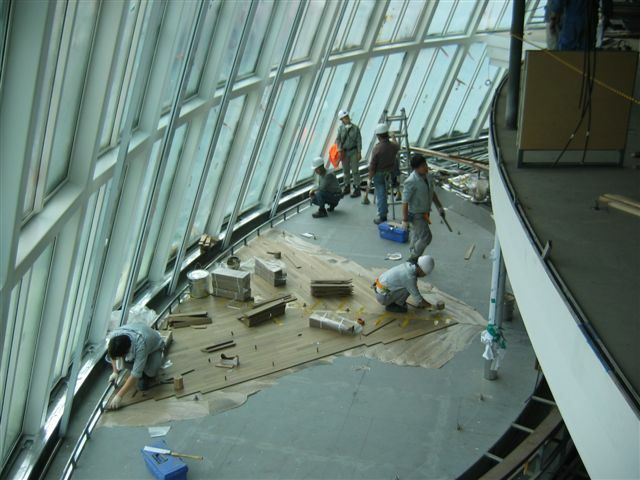 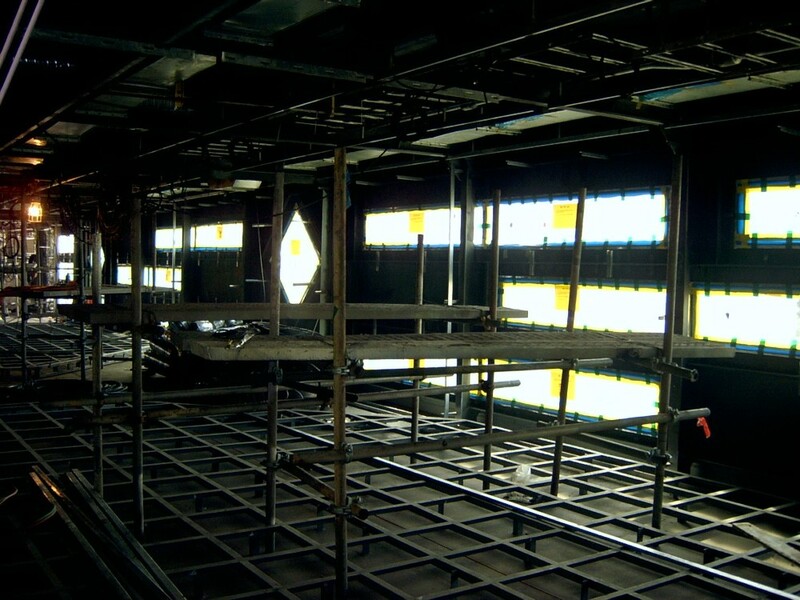 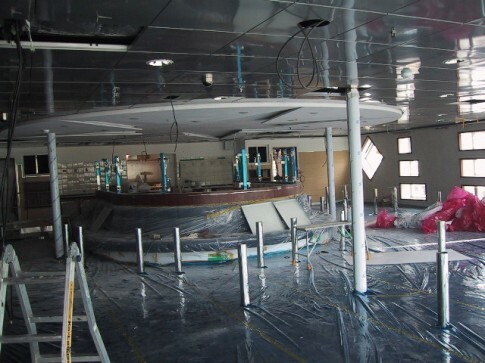 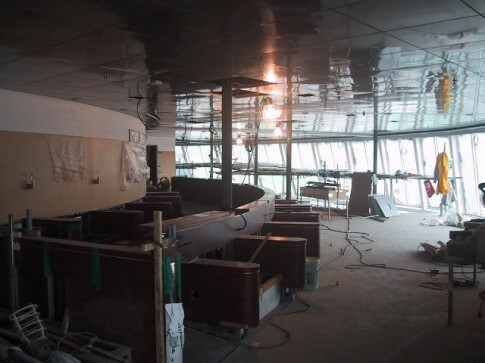 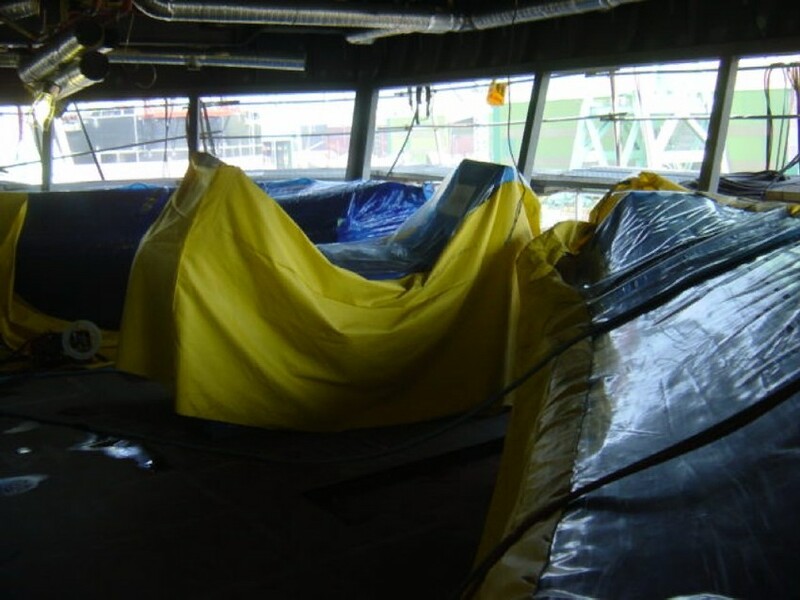 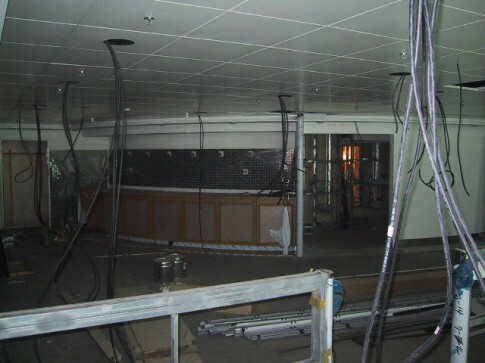 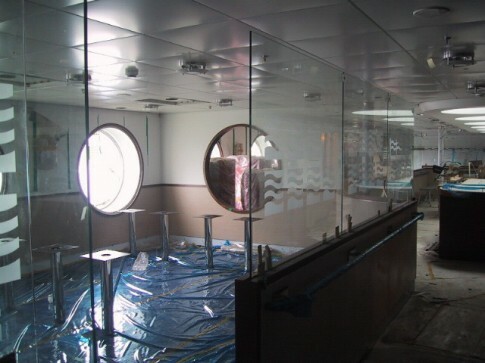 This view on the Maersk Dunkerque, from March 2005, shows what will become the mezzanine area overlooking the main self service restaurant on the deck below. 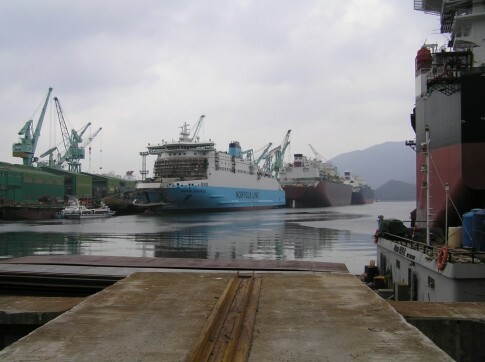 The same area on the completed Maersk Dover. 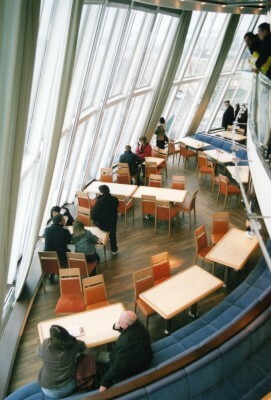 Part of the 'Road Kings' restaurant seating area, March 2005. 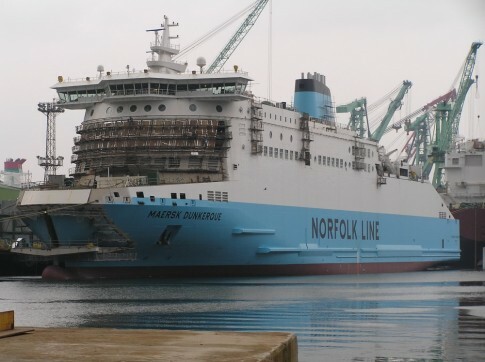 A Norfolkline image of the same area on the Maersk Dunkerque just before she entered service. 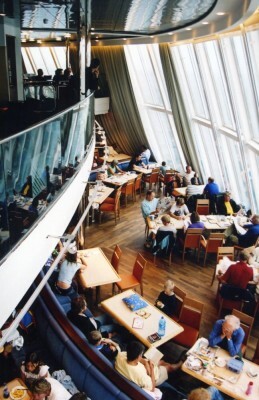 Looking aft at the 'Road Kings' restaurant on the port side, July 2005. 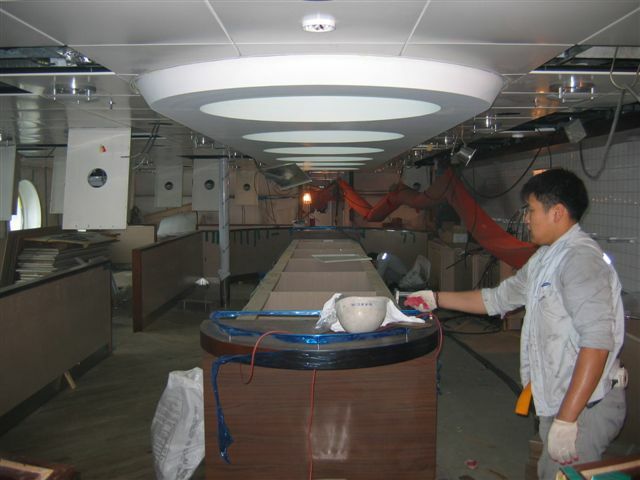 The ceiling of the restaurant is dominated by this deckhead-mounted Maersk star. 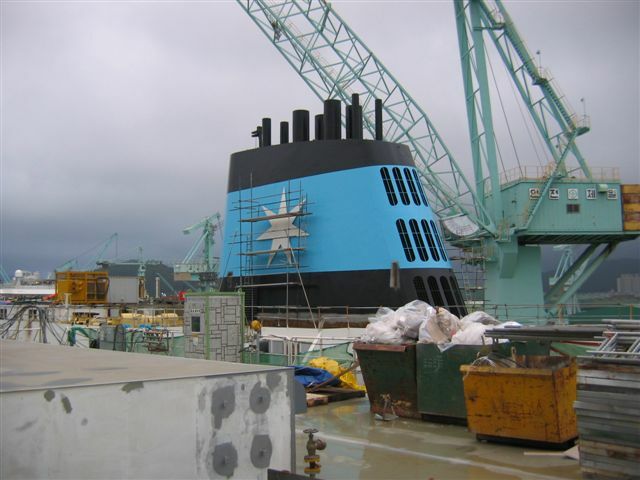 The completed star illuminated on board the Maersk Delft. 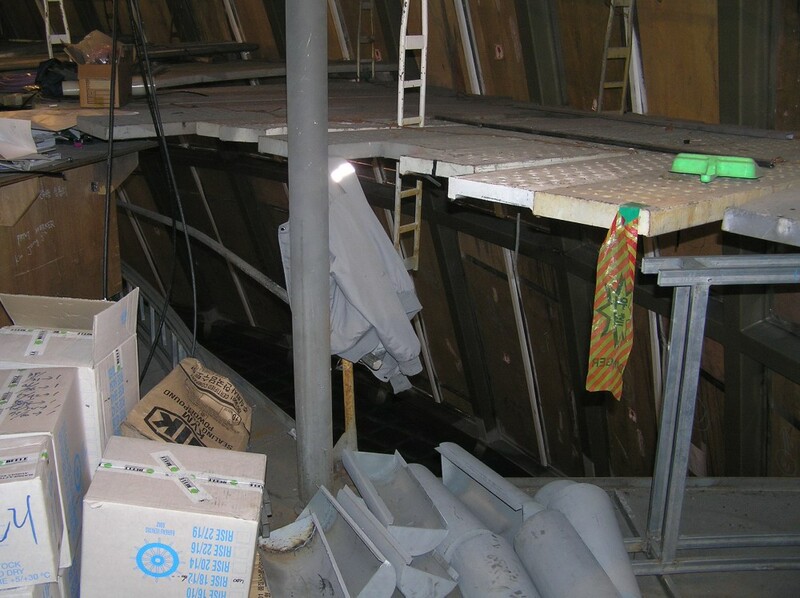 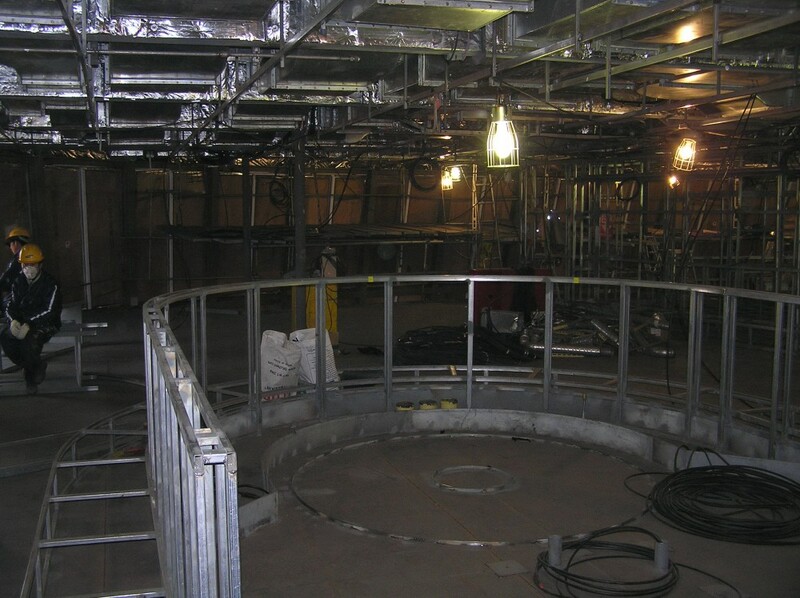 Looking across the mezzanine down to Deck 6 below (July 2005). 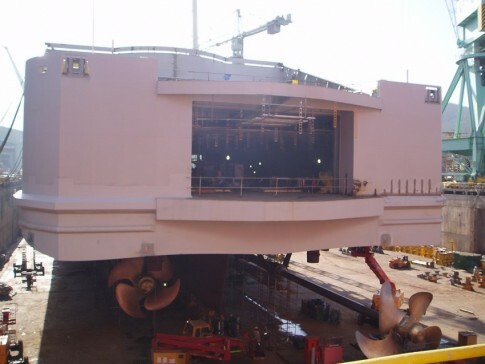 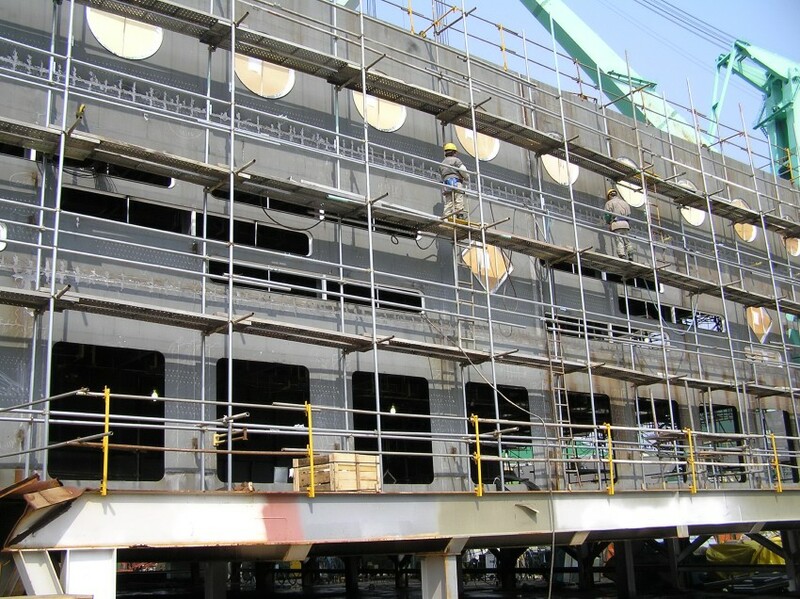 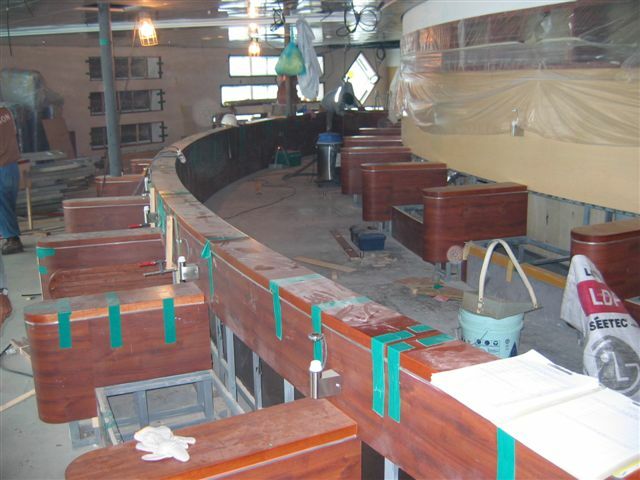 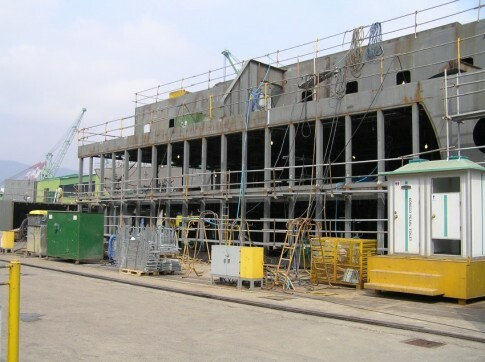 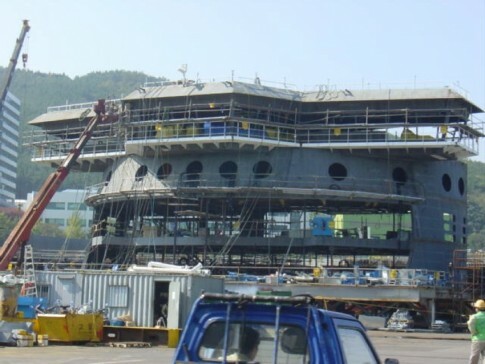 Spreading across the rest of the forward part of the ship is the adjacent freight drivers' lounge, seen here under construction in March 2005. Significant progress has been made by the time this image was taken four months later. 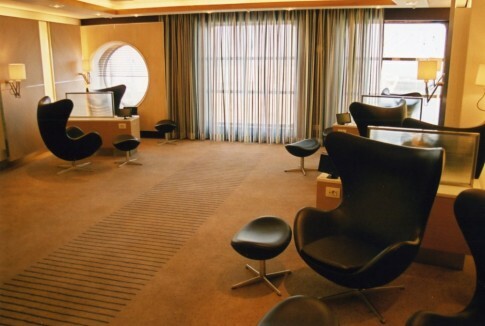 The completed lounge on the Maersk Delft. Looking across from starboard, March 2005. 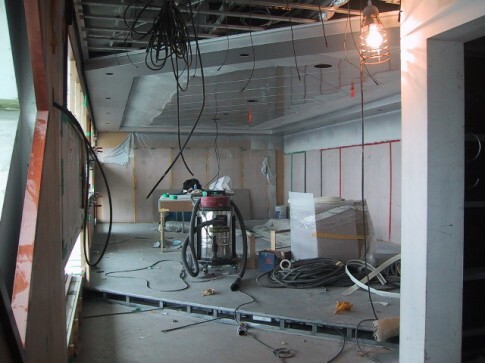 The space in late June 2005. Just aft on the starboard side, with its distinctive windows (later complete with sliding panels), is the truckers' Relax Lounge. 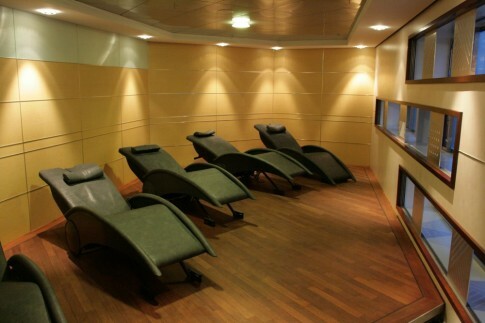 Ultimately fitted with massage chairs the space is seen here in January 2005. The completed space on the Maersk Dover, December 2007. 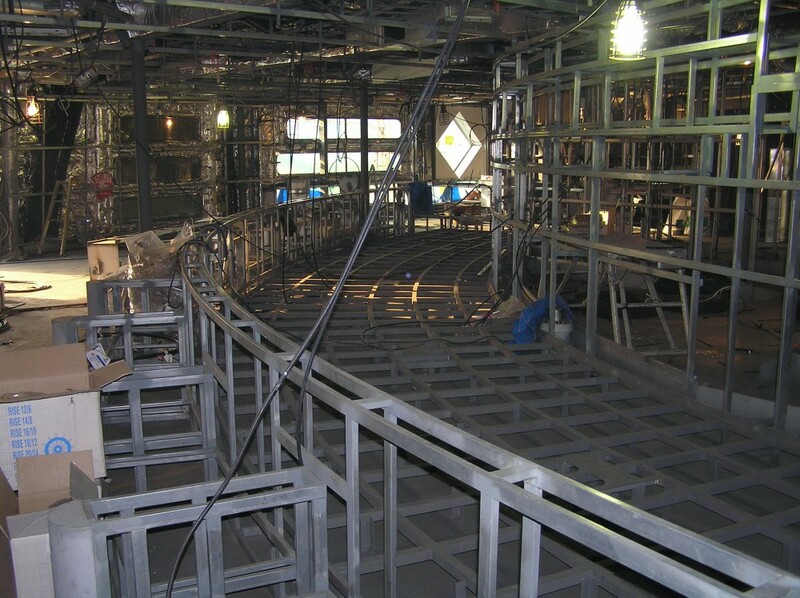 The forward section, March 2005. 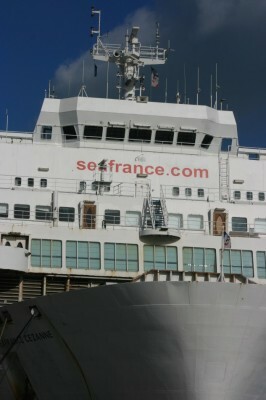 The aft section, June 2005. 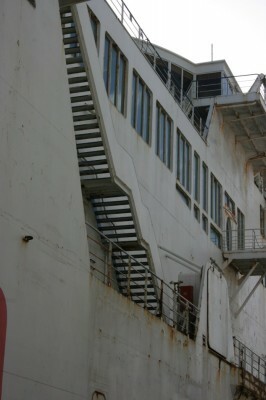 Moving aft slightly, outside the entrance to the 'Road Kings' section, is the upper part of the main lobby and forward staircase. 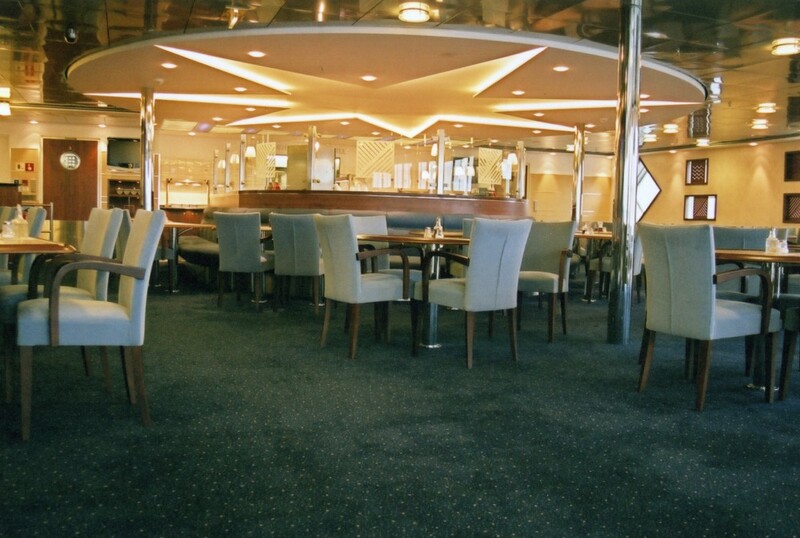 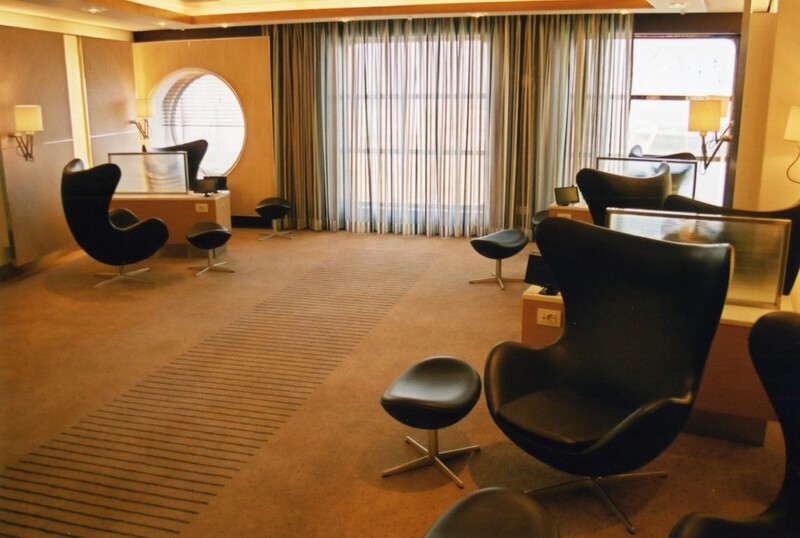 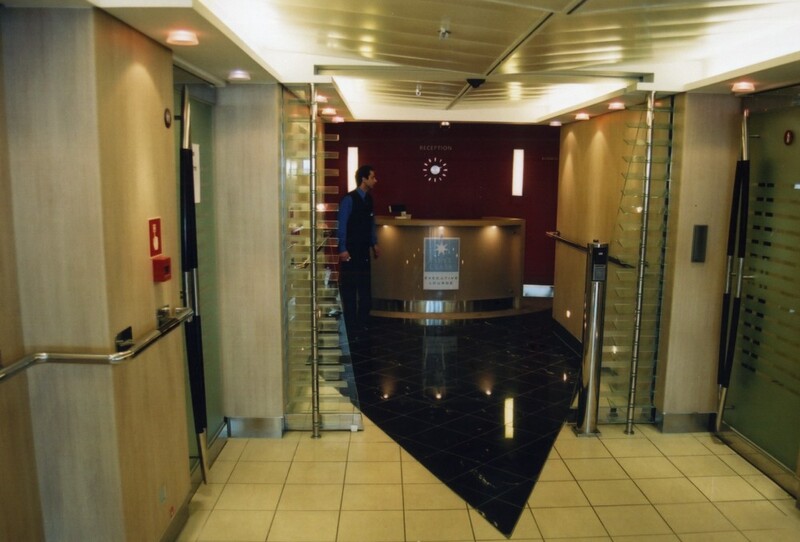 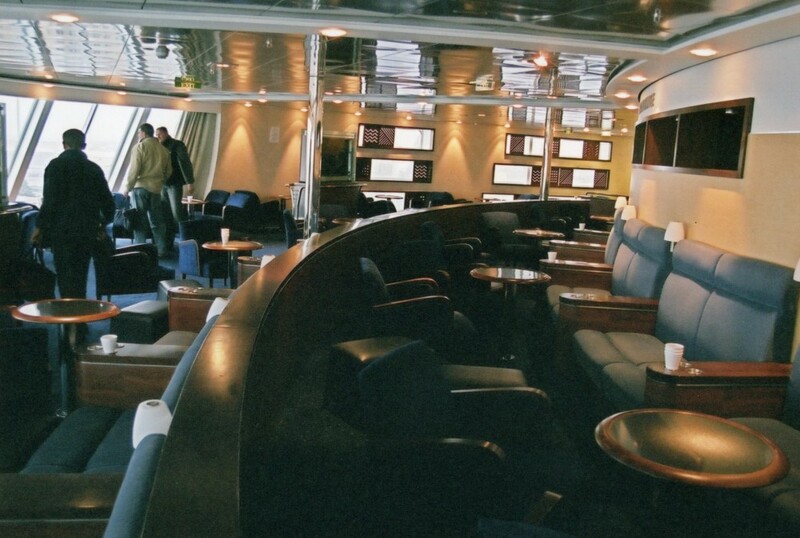 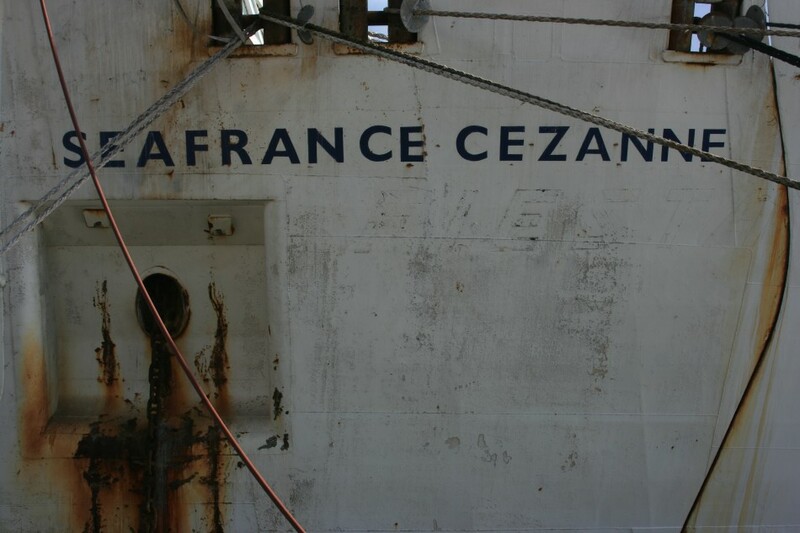 As completed, this is the most aggressively modernist space on board but looks fairly nondescript in this March 2005 shot on board the Maersk Dunkerque. 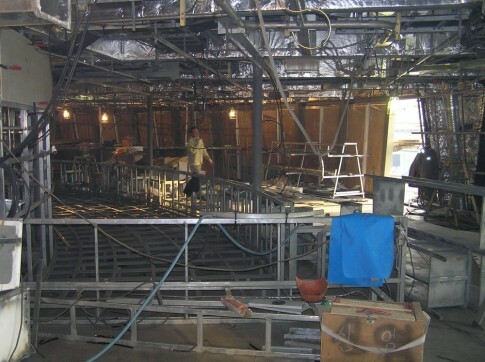 The scene in July 2005. The same area on board the Maersk Dover, October 2009. 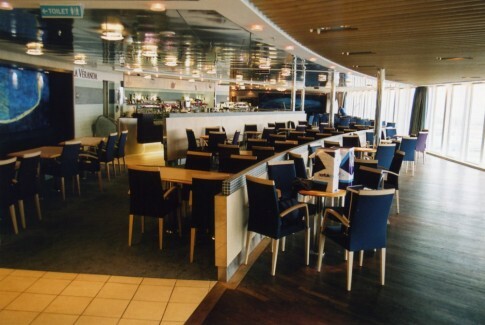 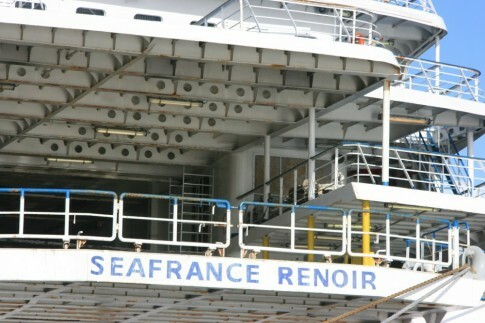 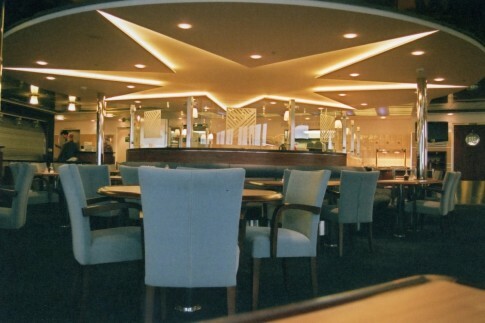 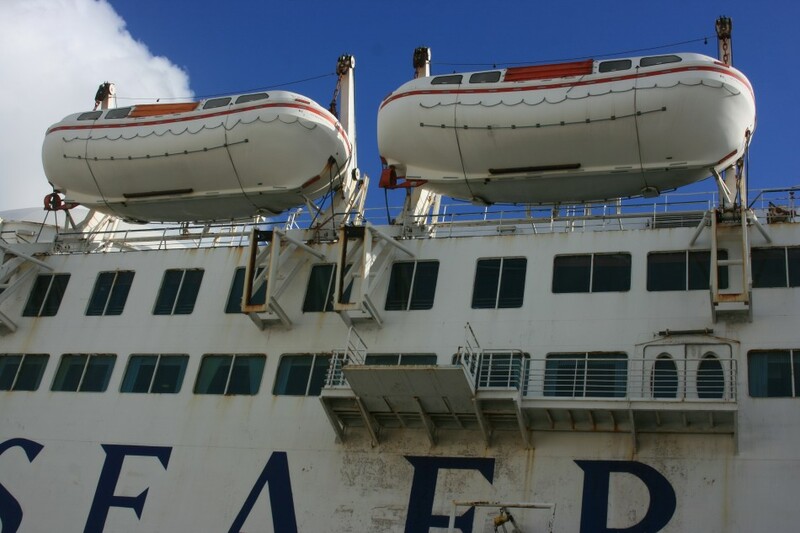 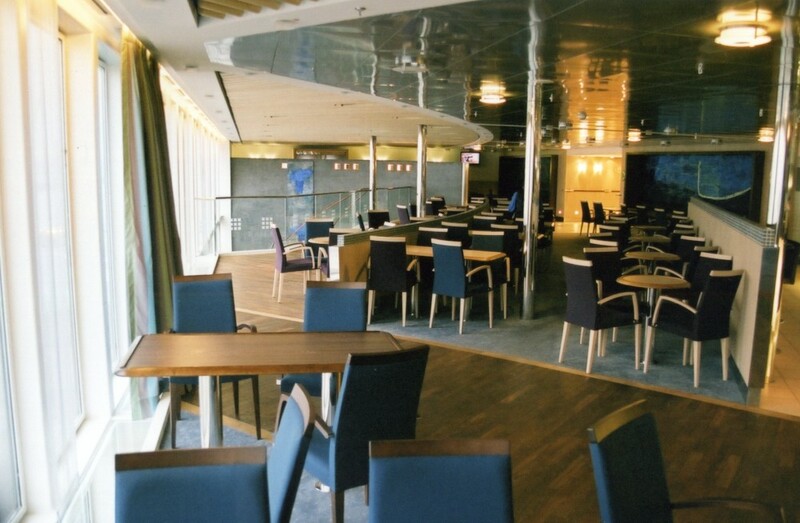 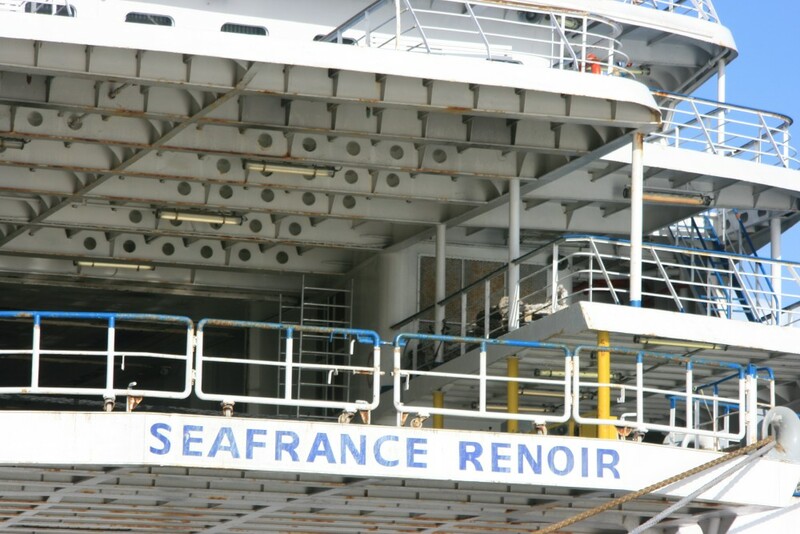 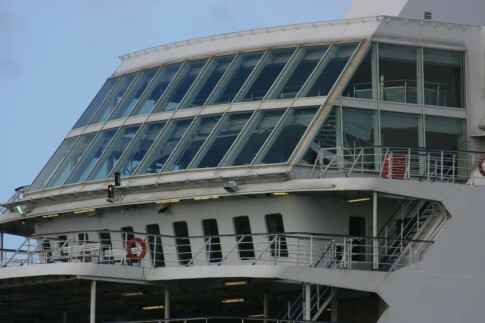 The passenger accommodation continues aft to starboard where, fronting the upper level of the twin-deck windows is La VÃ©randa, a bistro/cafÃ©/bar; in more recent times the forward section of this space has been appropriated as a more formal table-service restaurant. This is the scene in July 2005. 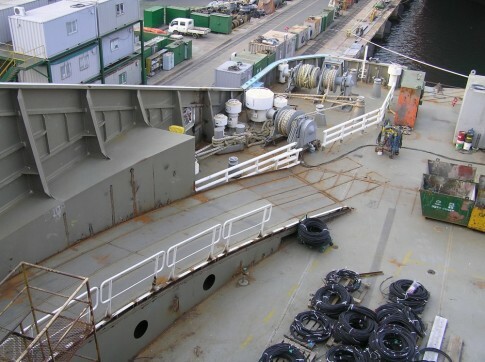 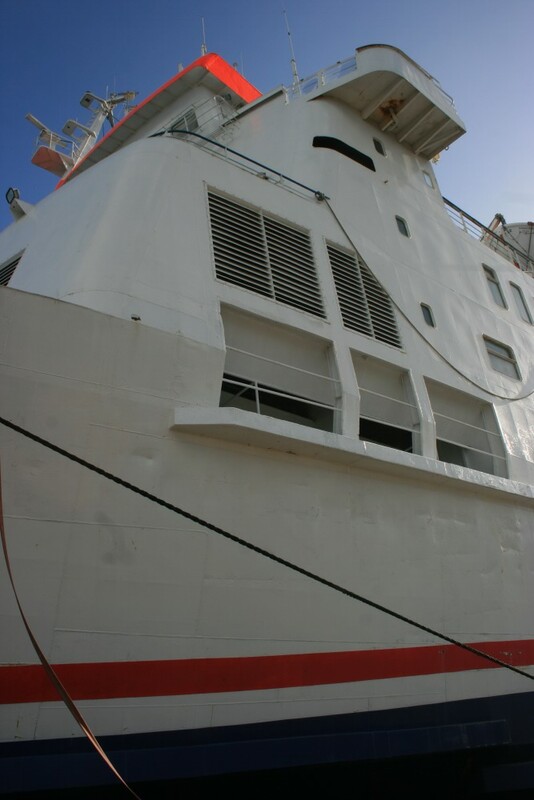 The same area on the Maersk Delft in 2006. In the background can be seen two of the artworks created for the ship by the Danish artist Anne VilsbÃ¸ll. 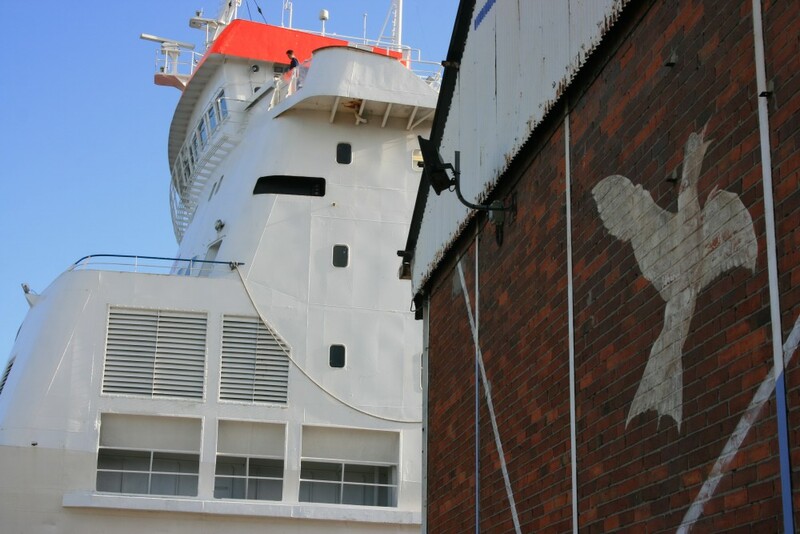 Each ship was entrusted to different artists, the Maersk Dunkerque receiving work from Jan van Lokhorst and the Maersk Dover Per Arnoldi, some 40 years after he had been similarly commissioned by DFDS to provide art on their Copenhagen-Oslo mini car liners Kong Olav V and Prinsesse Margrethe. 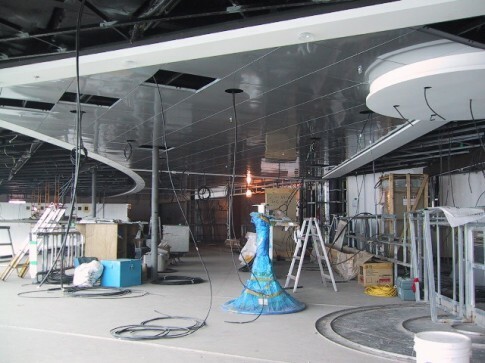 In between times, Arnoldi has become internationally renowned and is most well known in the UK for his work with Lord Rogers on the National Police Memorial in London. 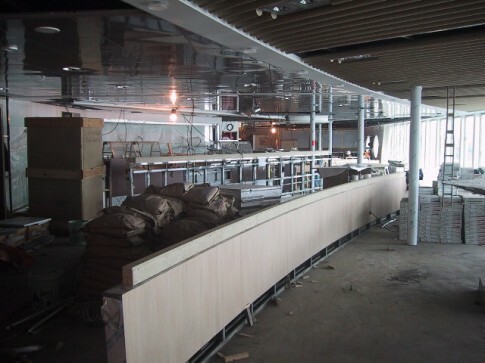 Looking aft with what will become La VÃ©randa's servery area to the right. 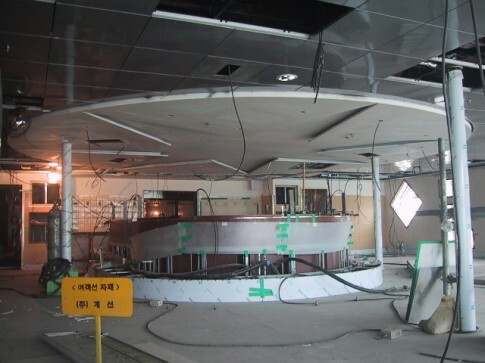 The same area looking forward, June 2005. 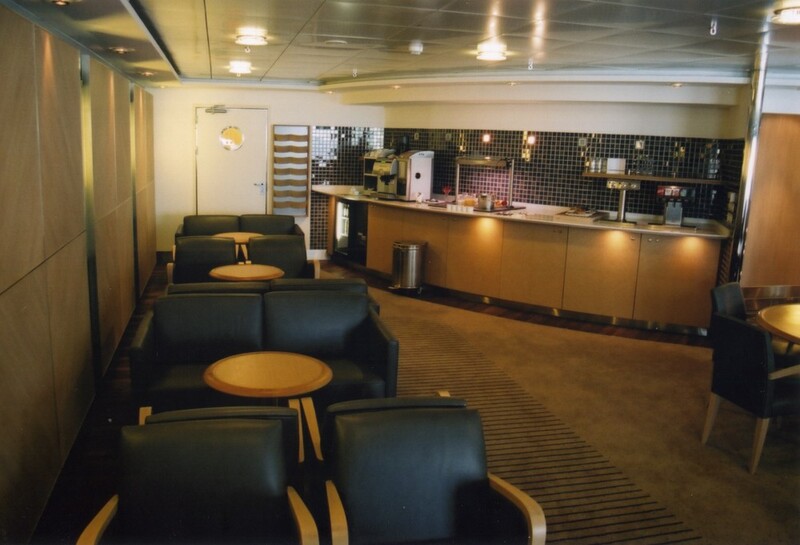 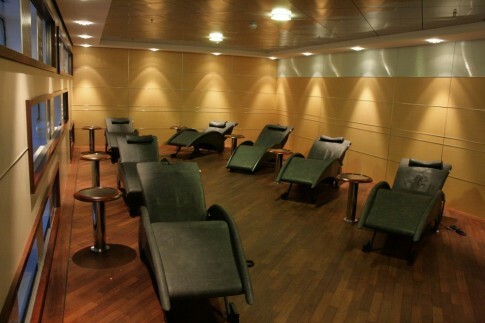 Aft on the port side is the First Class area - two lounges (a VIP and a Business Lounge) accessible by swipe card upon paying a supplement. The entrance to this area is seen in July 2005. 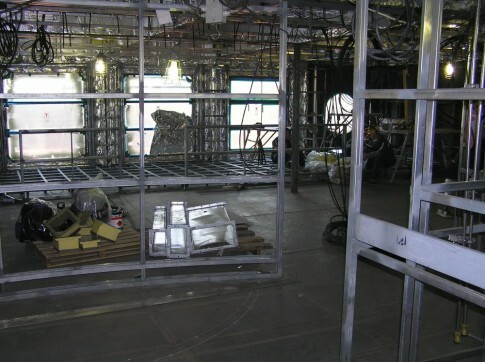 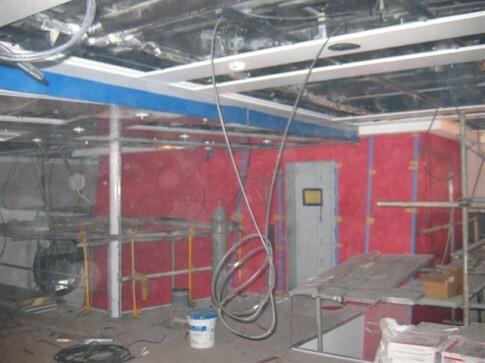 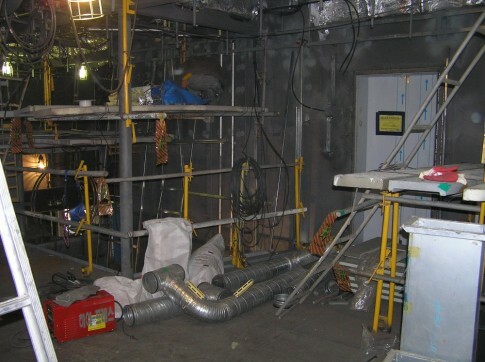 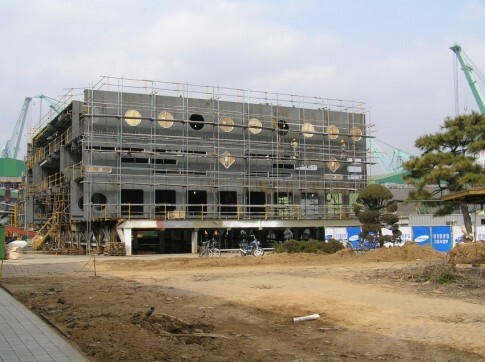 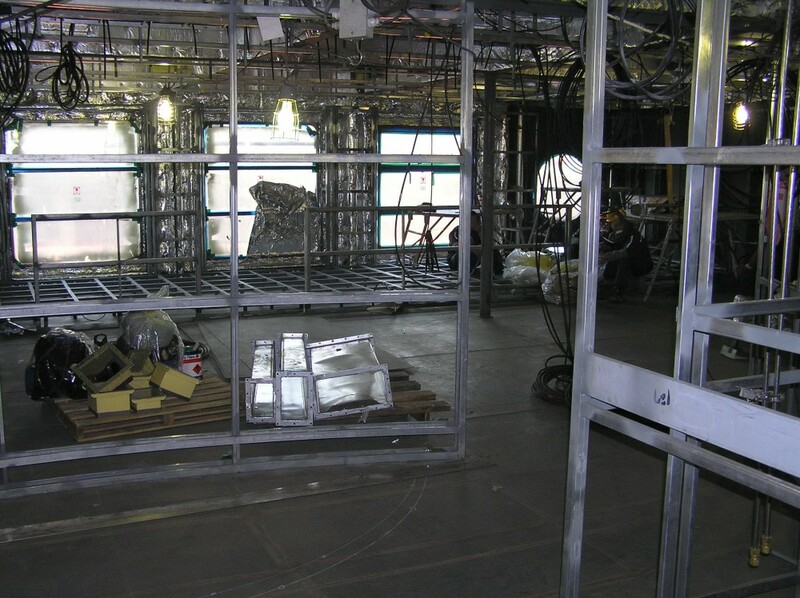 The aftermost of the two rooms, the VIP lounge, is seen here under construction in March 2005. The completed space on the Maersk Delft, complete with excruciatingly expensive Arne Jacobson 'Egg' chairs. 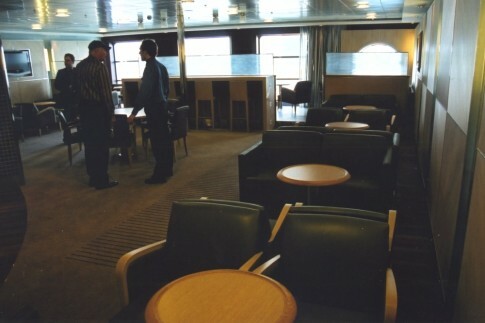 The adjacent Business Lounge, seen in March 2005. 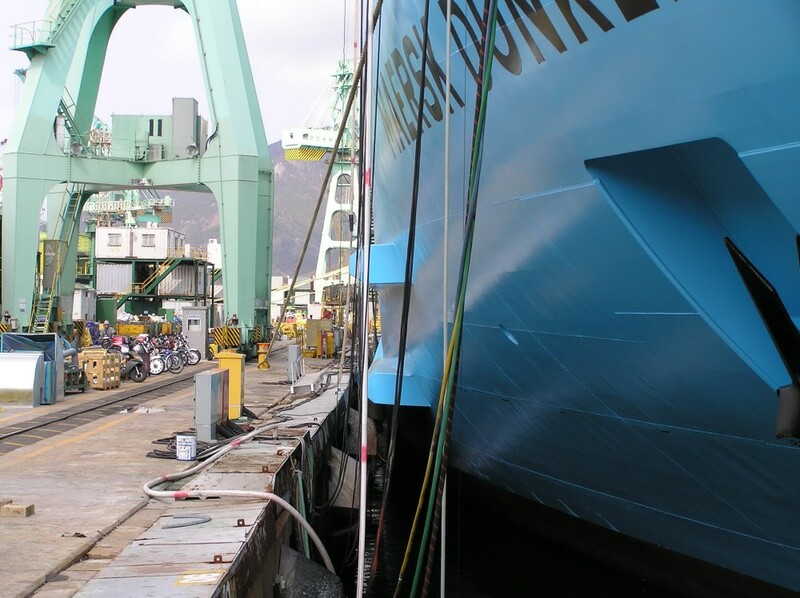 The completed space on the Maersk Delft. 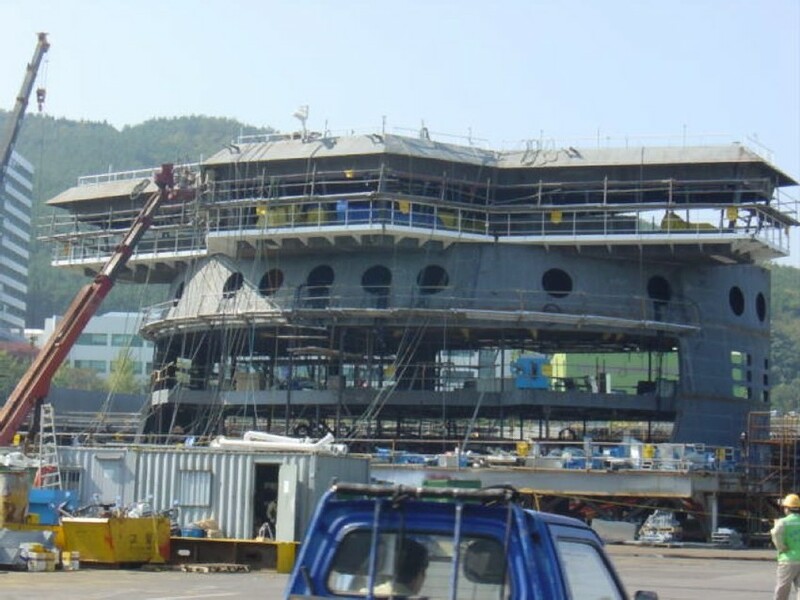 Another angle, taken in June 2005. 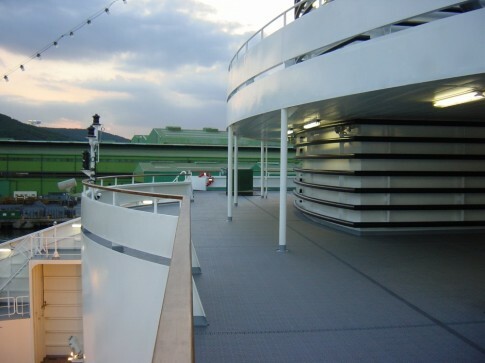 Aft on Deck 7 is further outside deck, albeit accessed from Deck 6 below. 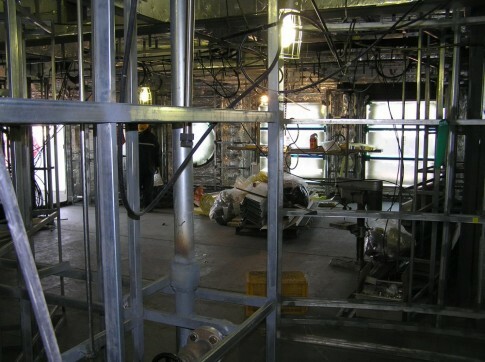 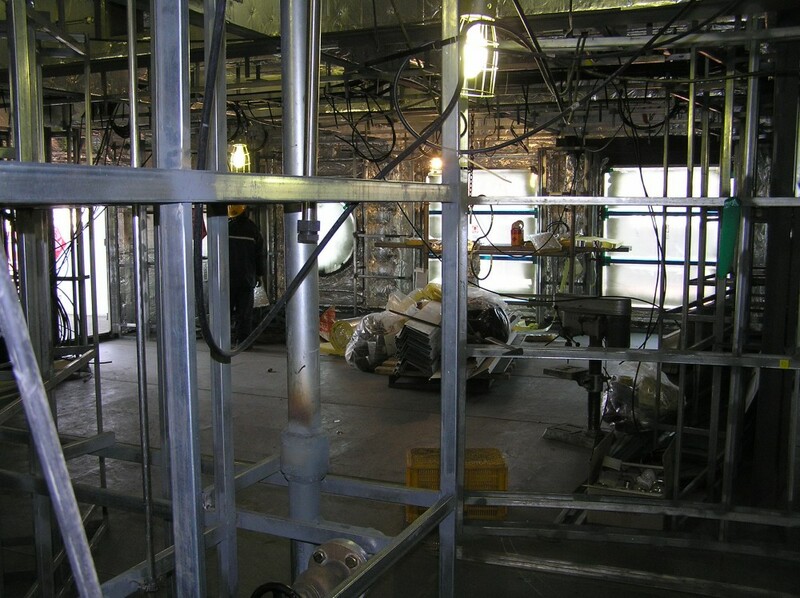 Moving behind the scenes, this enclosed space will become the Officers' Mess, forward on Deck 8. 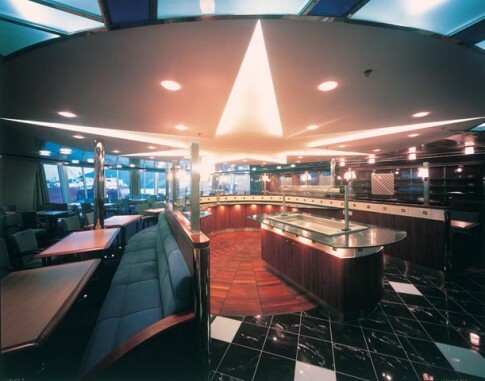 The buffet area in the crew mess, just aft. 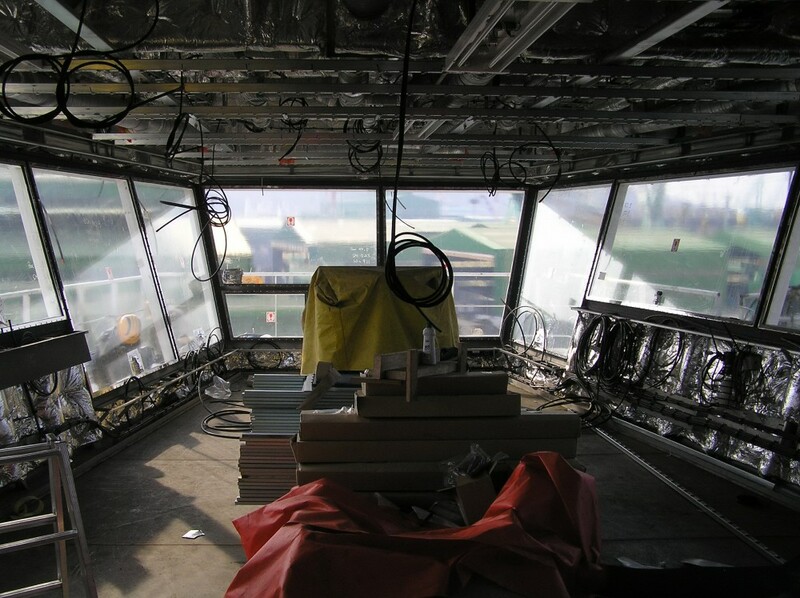 Although we have focussed on the passenger spaces in the final two posts of this series, the real success of the ‘D’ class is in their continuing inroads into the core freight market. 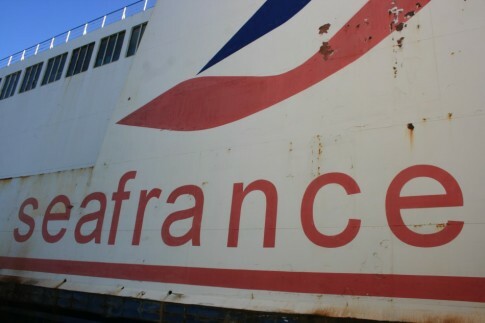 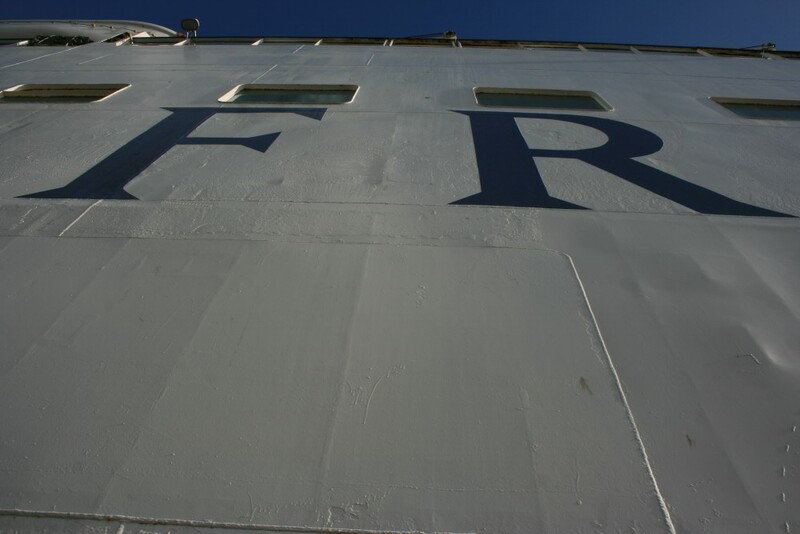 Whereas pretenders such as LD Lines have, after much effort, achieved less than a 5% share of the England-France ferry freight market (excluding the Tunnel), Norfolkline are now second only to P&O, with approximately 20-25%. 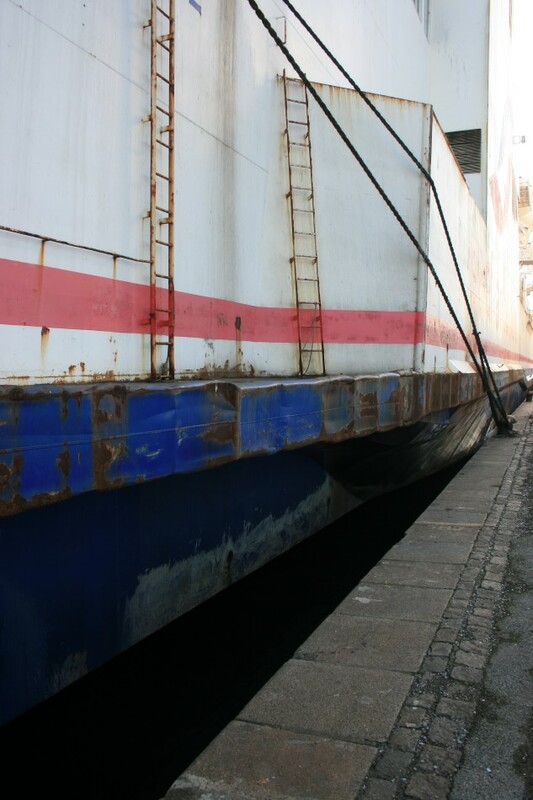 Using only three ships the freight load factors achieved are the envy of everyone else, so the next big problem facing the class just might be a lack of capacity come the economic recovery. Having previously been owned by Maersk, and now DFDS, it seems counter-intuitive to describe Norfolkline as an insurgent operator. However, competing against long-established rivals and having commenced operations less than a decade ago, it is certainly not an unfair categorisation. 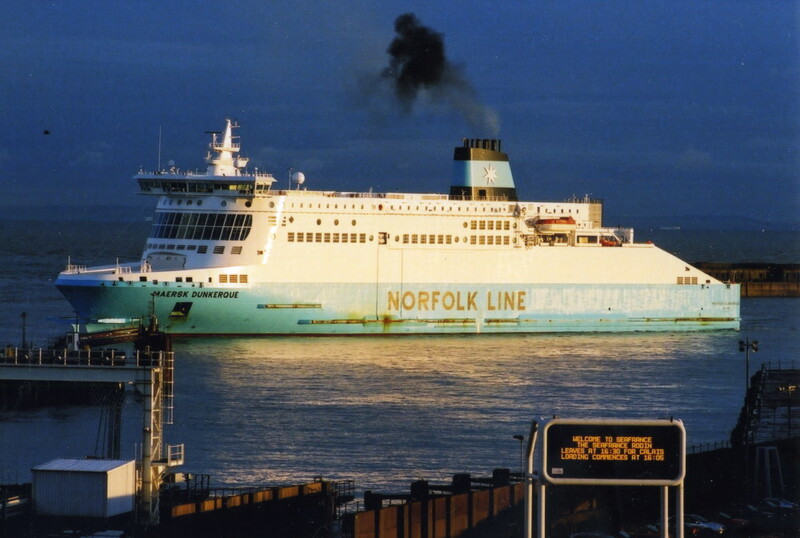 Where Norfolkline as a whole, under its new owners, goes next is difficult to predict, but the ‘D’ class, at least, are likely to be around for several years yet. 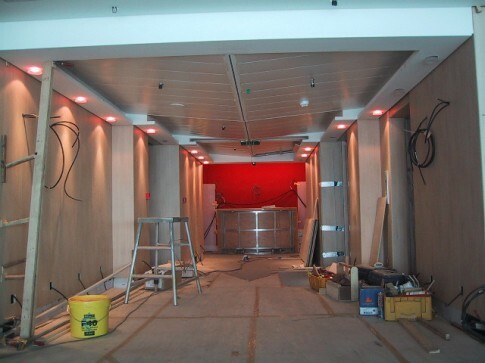 With grateful thanks to Stephen Mackenzie at Norfolkline for the under construction images. 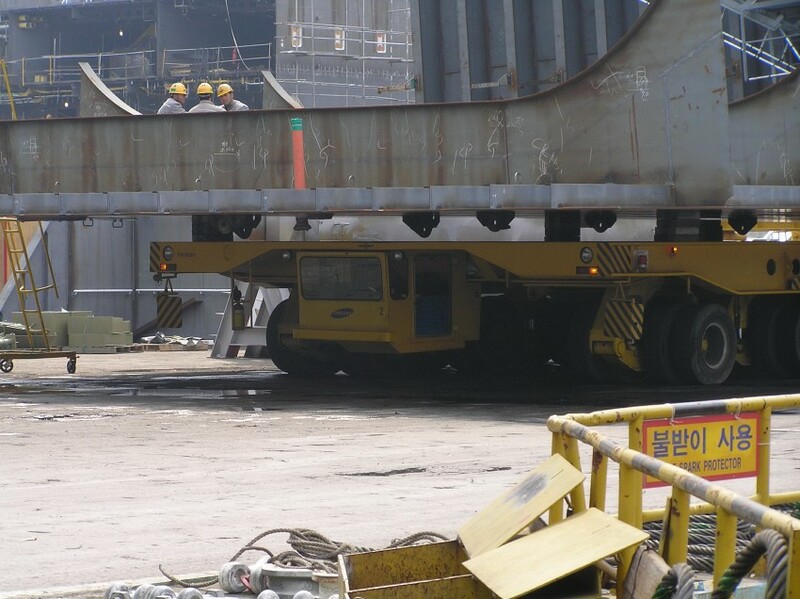 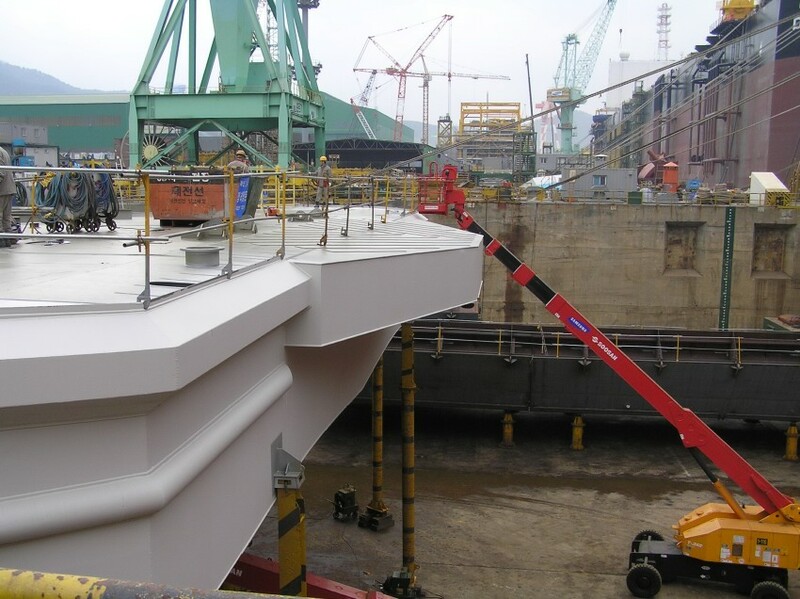 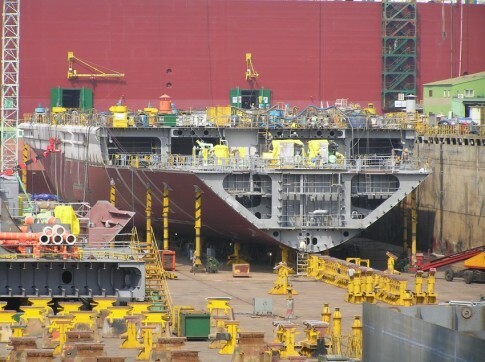 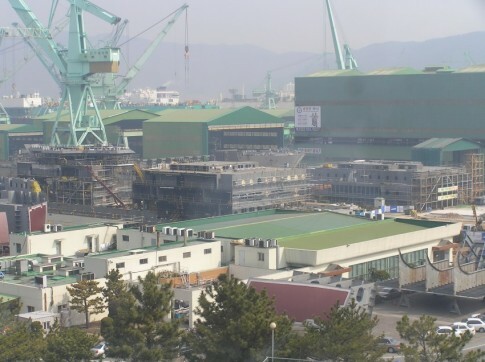 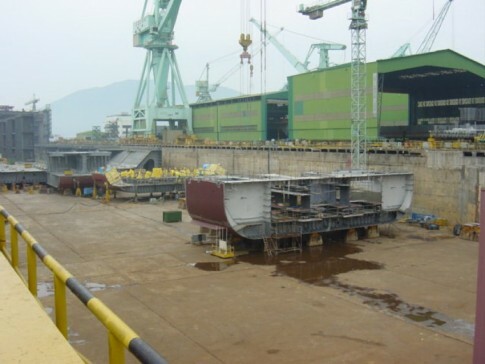 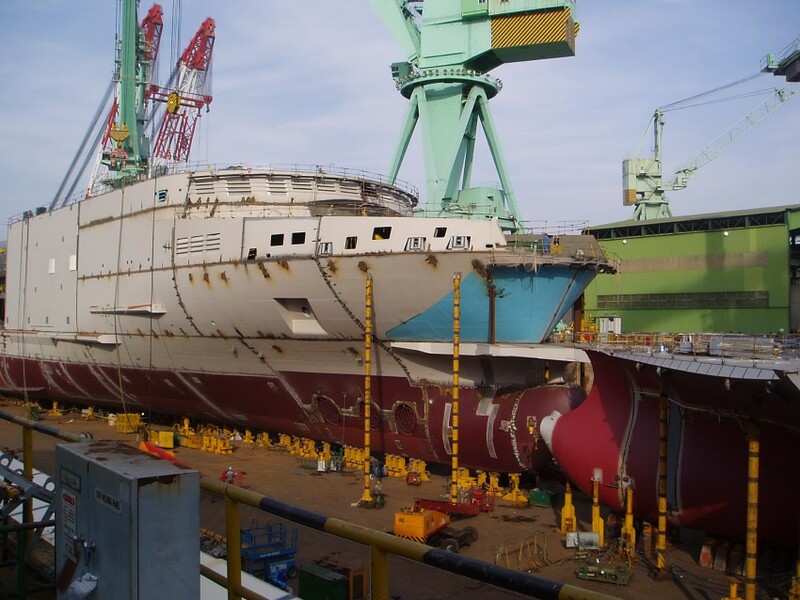 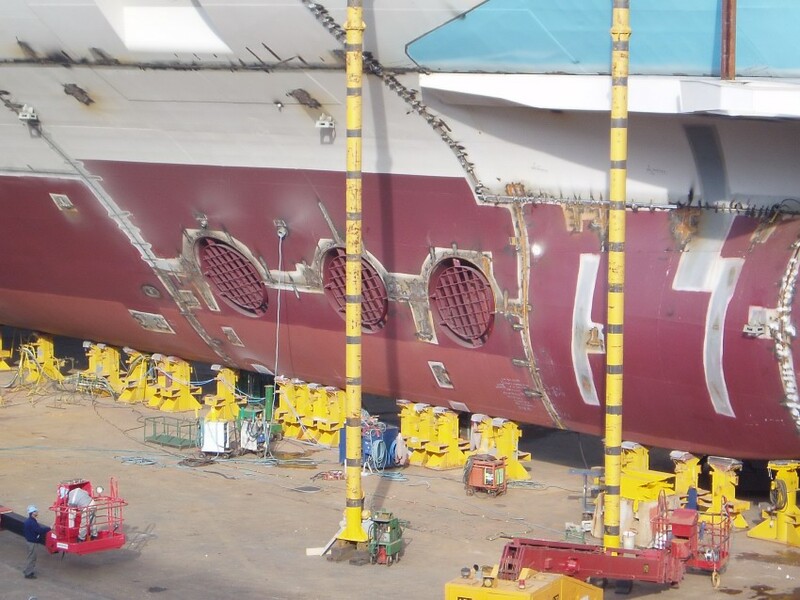 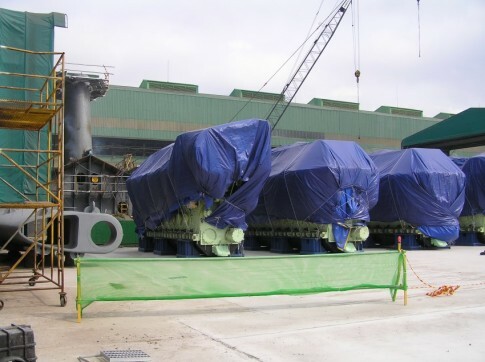 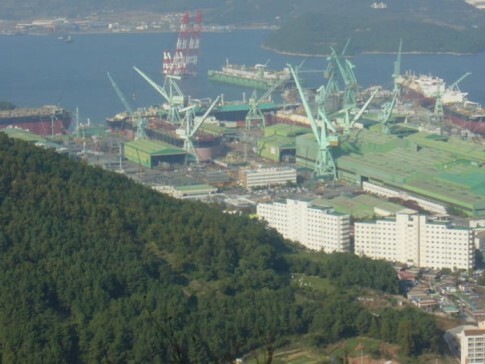 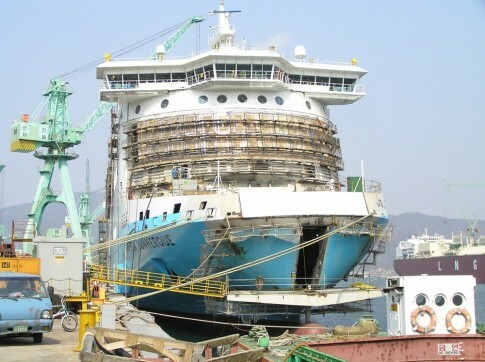 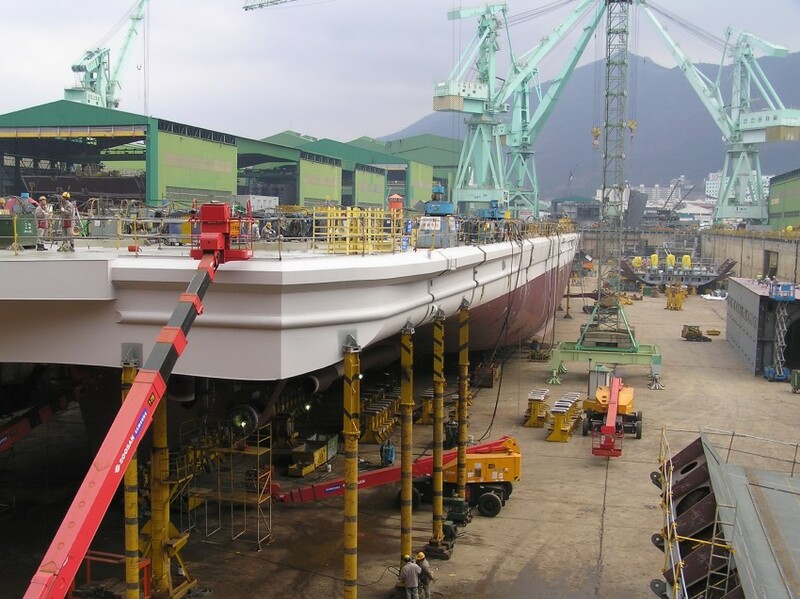 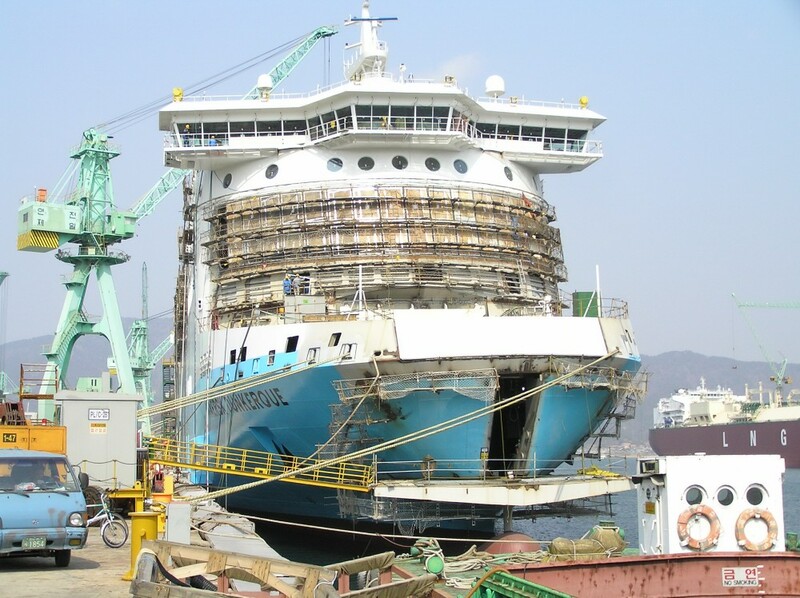 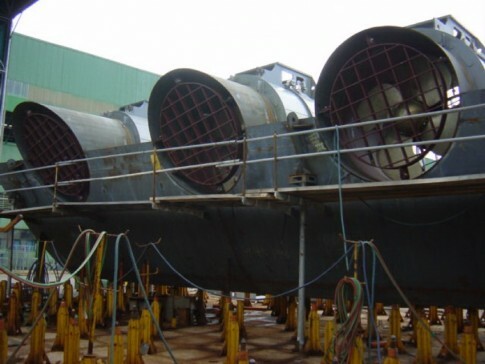 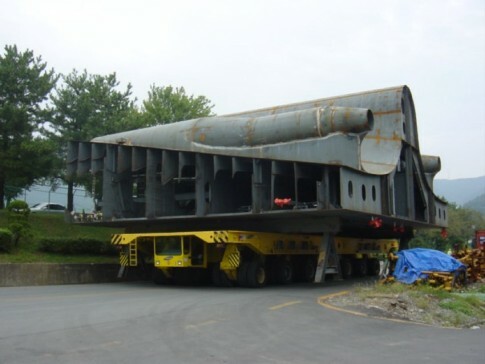 In the first part of our look at the construction of the Maersk ‘D’ class, we reviewed the three vessels at various stages as they grew from the bottom up in the Samsung shipyard at Geoje in South Korea. This second series of images shows the Maersk Dunkerque over the period March to September 2005, through sea trials and up to the ship being handed over on 27 September. 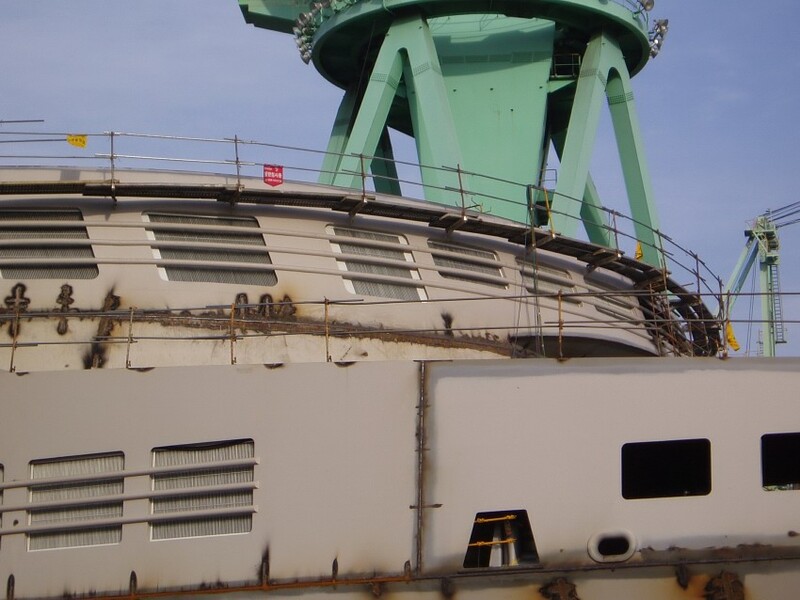 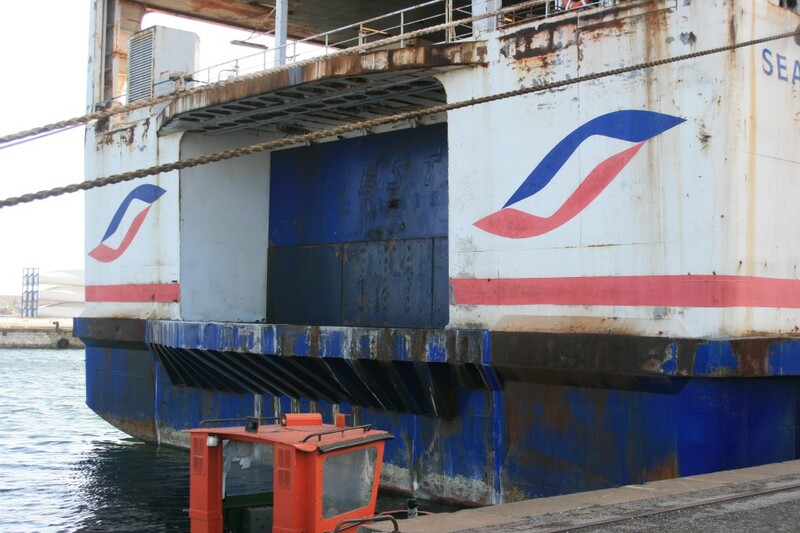 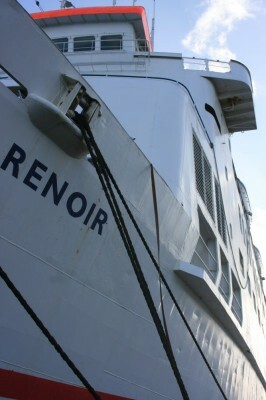 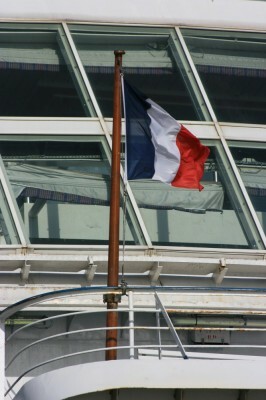 March 2005, and the 'Dunkerque' has been painted for the first time. 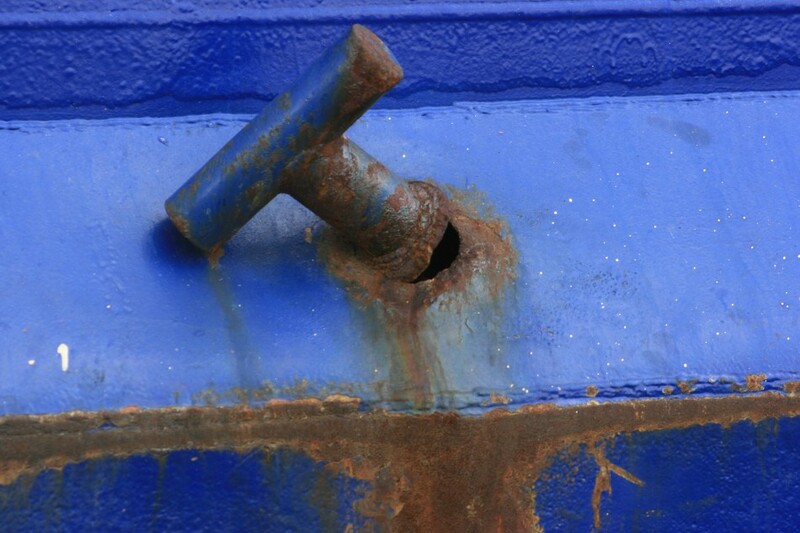 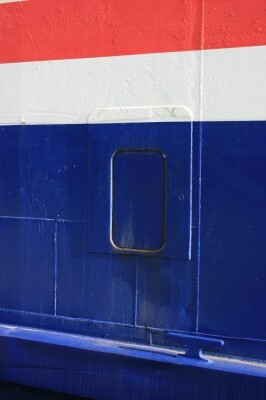 The stern door. 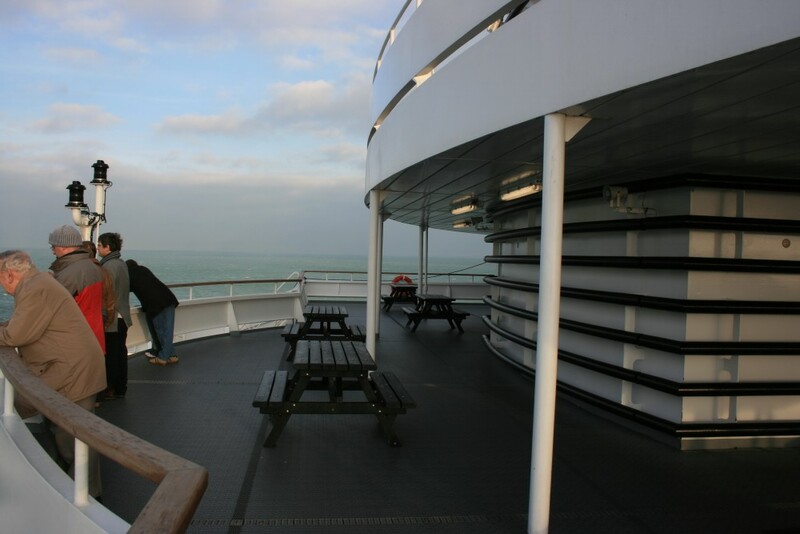 Above, the 'lip' for the linkspan to rest upon when in port at Dover is visible. 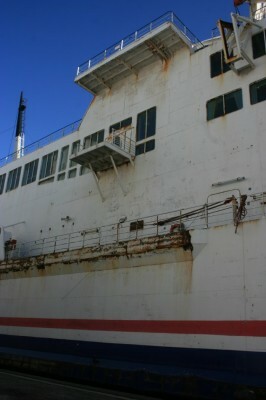 At the stern of the ship, at the upper vehicle deck level. On the far (starboard) side, the internal ramp leading to the third vehicle level, for cars only, can be seen. 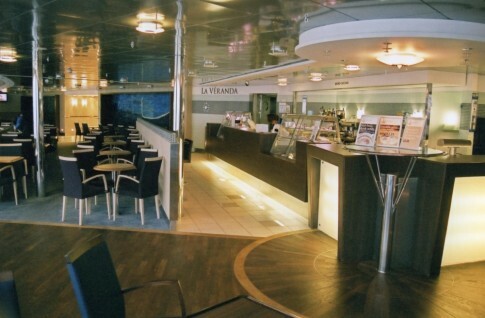 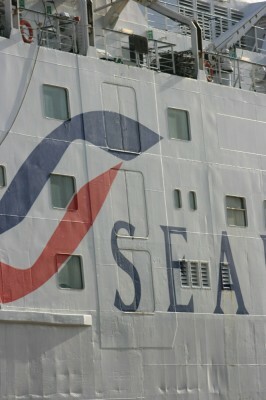 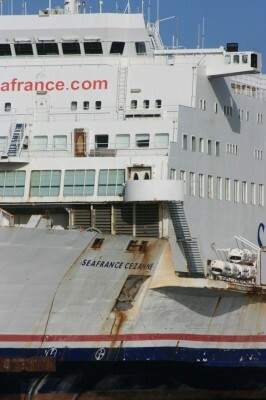 In this area the ships have an arrangement similar to Irish Ferries' Ulysees of 2001. Looking down from above the bridge to the forecastle. 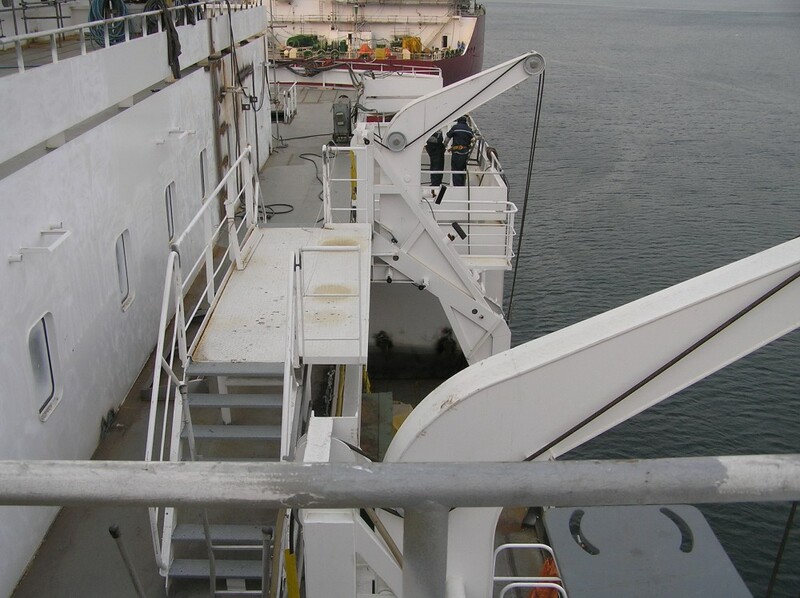 Looking back from the top of the bridge to the funnel. Just aft of the bridge on the starboard side, these skylights allow natural light to flow down onto the buffet area of the crew mess below. The classic Maersk funnel before the addition of the star. 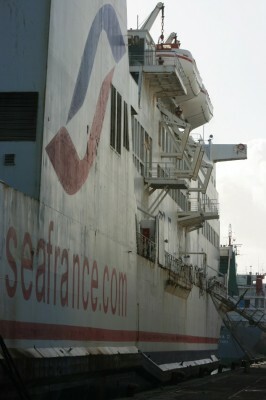 The choice of funnel design has been criticised for being at odds with the otherwise overt modernity of the ships. 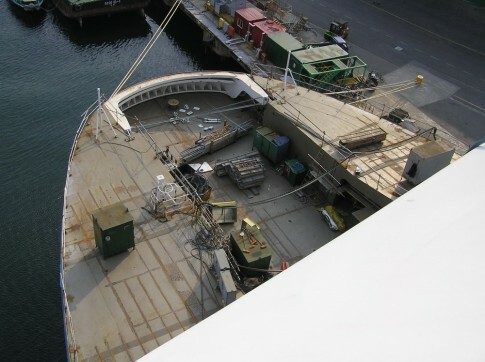 Looking down at the stern with another view of the ramp to the upper car deck. A unique view, looking forward from the top of the funnel. 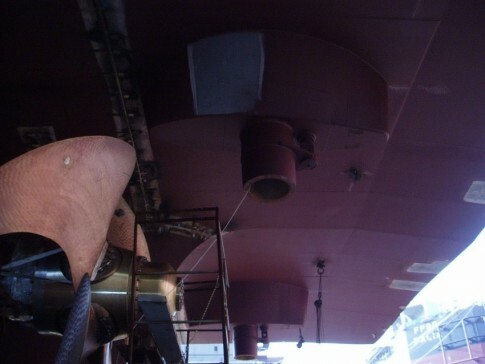 Amongst the 'forest' of exhausts atop the funnel. 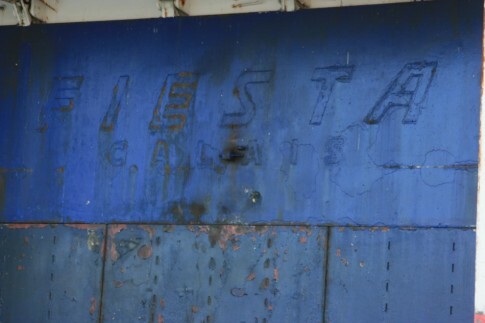 These are still pristine but will later be black in appearance. 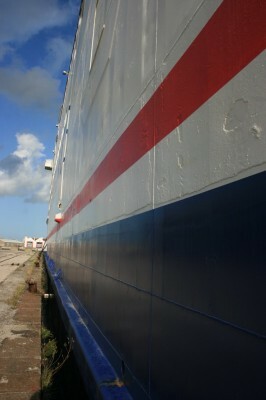 Looking aft from the funnel. 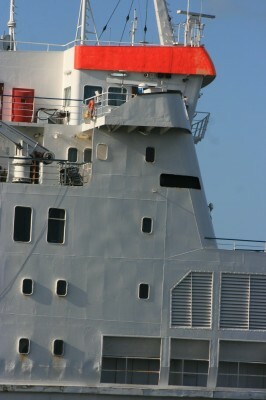 Close up of the large 'cow catcher' for use with the Dunkerque linkspan. 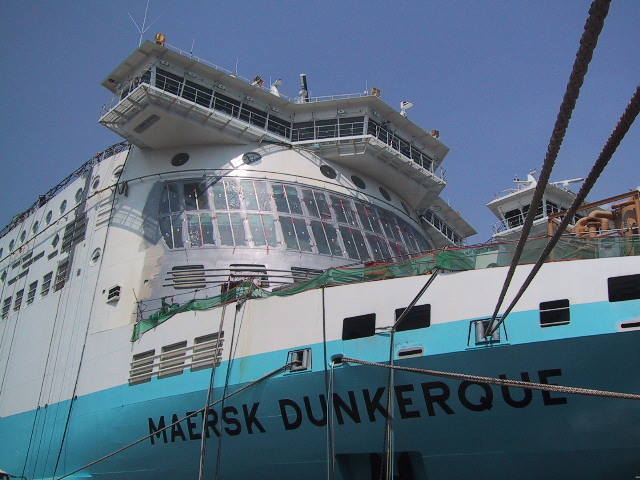 The Maersk Dunkerque and Maersk Delft, May 2005. 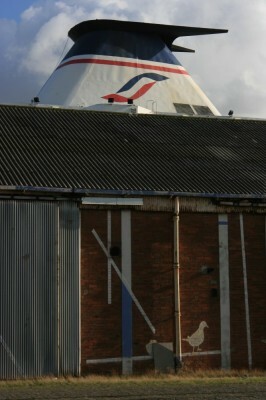 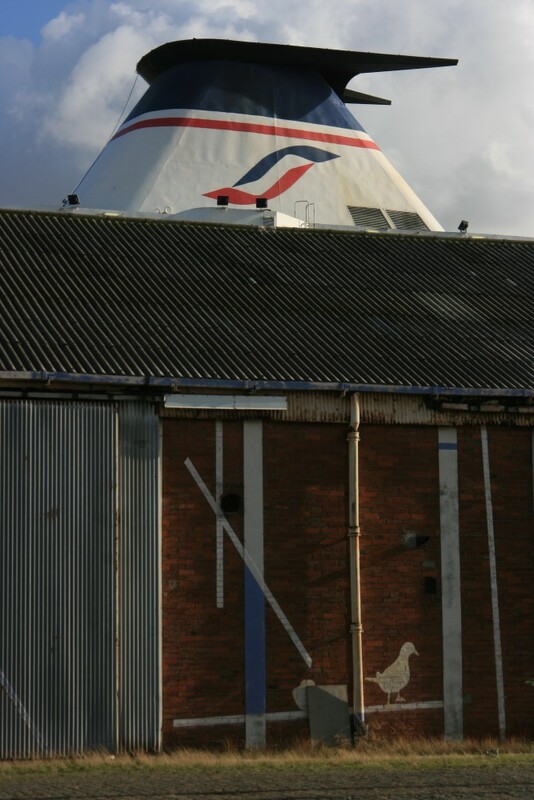 The funnel, with the Maersk star now in place. 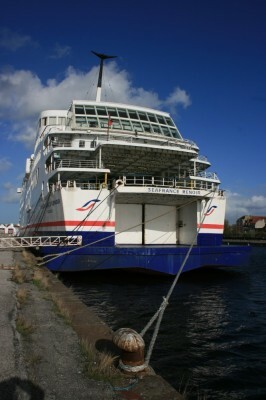 The 'Dunkerque' heading out for sea trials, 1 June 2005. 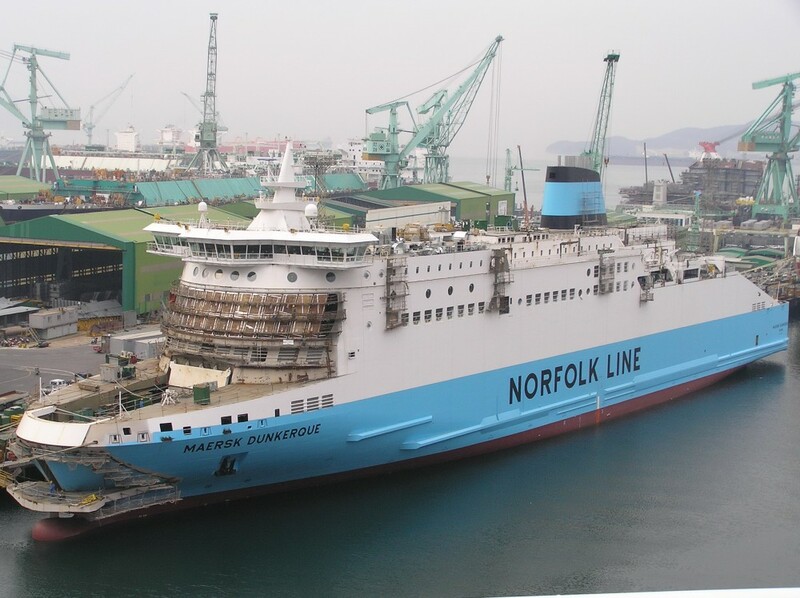 27 September 2005: the Maersk Dunkerque is handed over to Norfolkline. 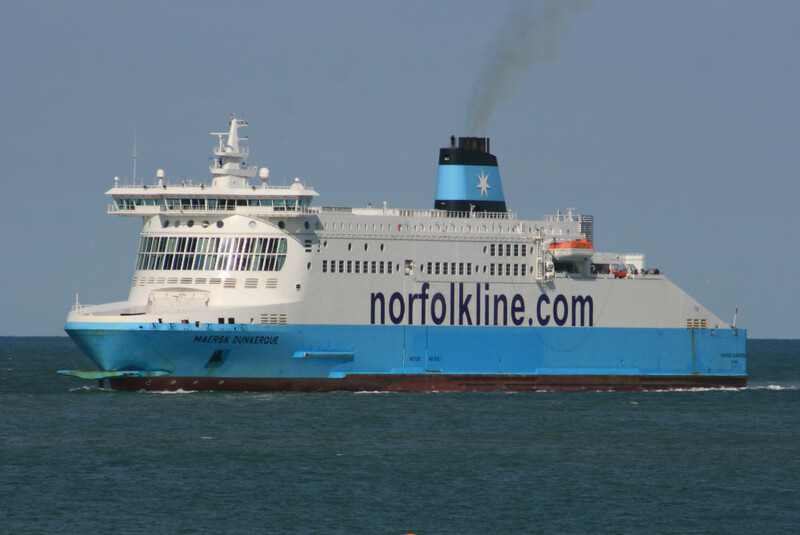 With grateful thanks to Stephen Mackenzie at Norfolkline. The next part of this series will look inside the embryo interiors as the Maersk Dunkerque approached completion. 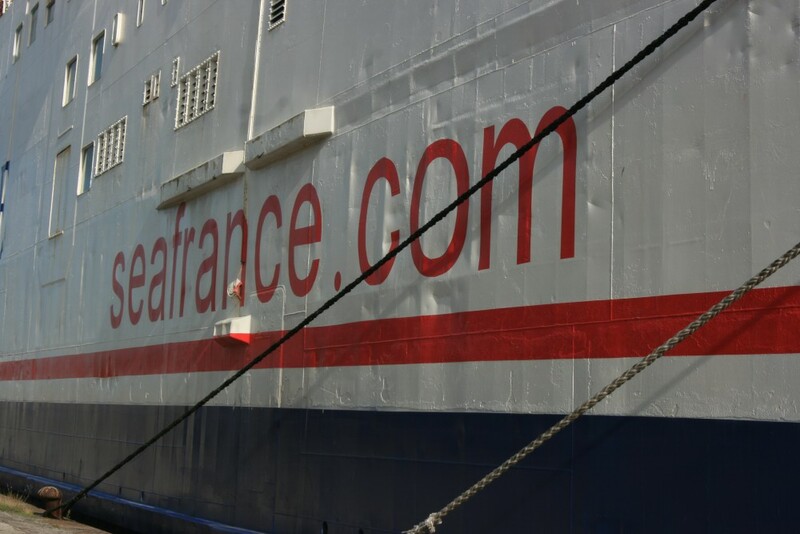 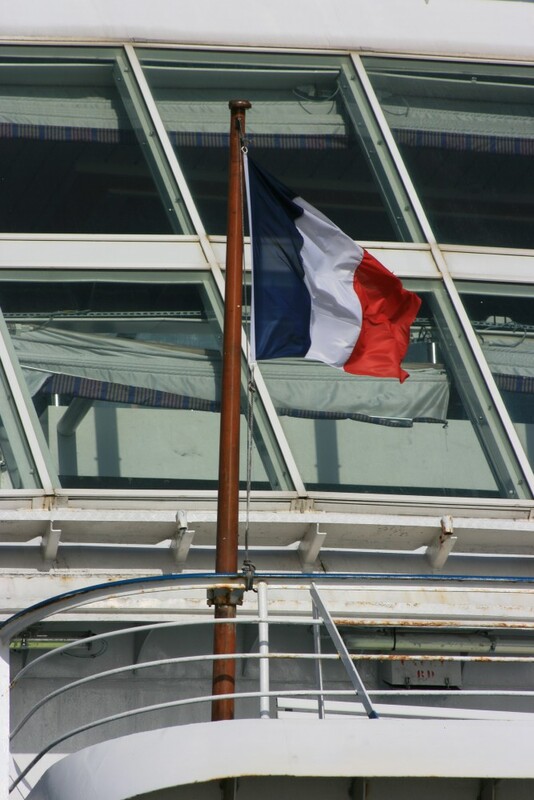 There have been some significant new ships for Cross-Channel operators in the past decade, most notably the Seafrance Rodin and Berlioz on the short sea and the Mont St Michel and Pont-Aven in the Western Channel. 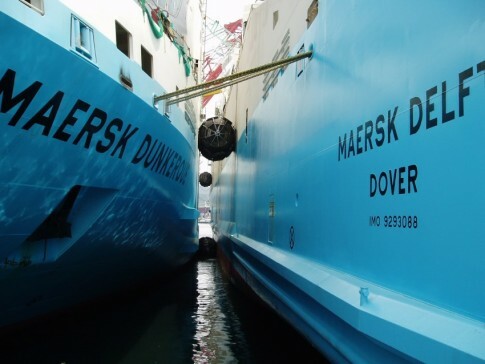 Taking their place alongside these vessels, for established operators, came the three ships of the Maersk â€˜Dâ€™ class. Entering service in 2005/2006, the Maersks Dunkerque, Delft and Dover are remarkable partly because they were delivered to what was still in many peopleâ€™s minds an â€˜upstartâ€™ operator and partly because they were such a momentous upgrade from the existing ships. 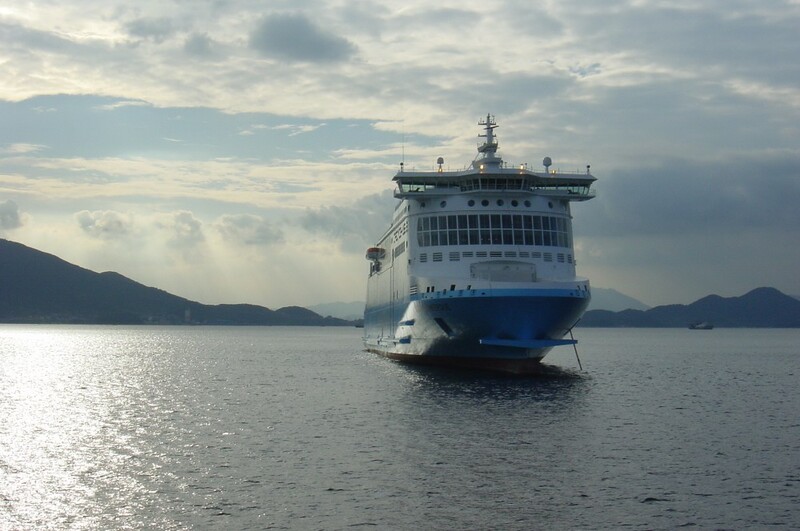 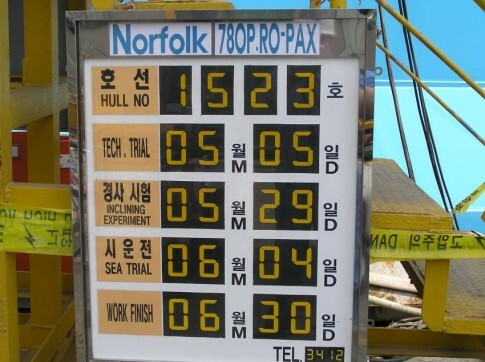 Built by Samsung at Geoje in Korea with interiors by Steen Friis Hansen, the ships have generated significant extra traffic for Norfolkline, building on the success of the earlier Racehorse class. 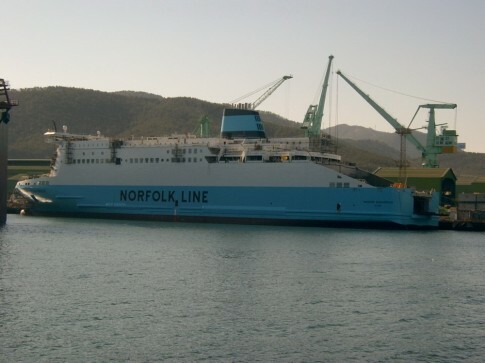 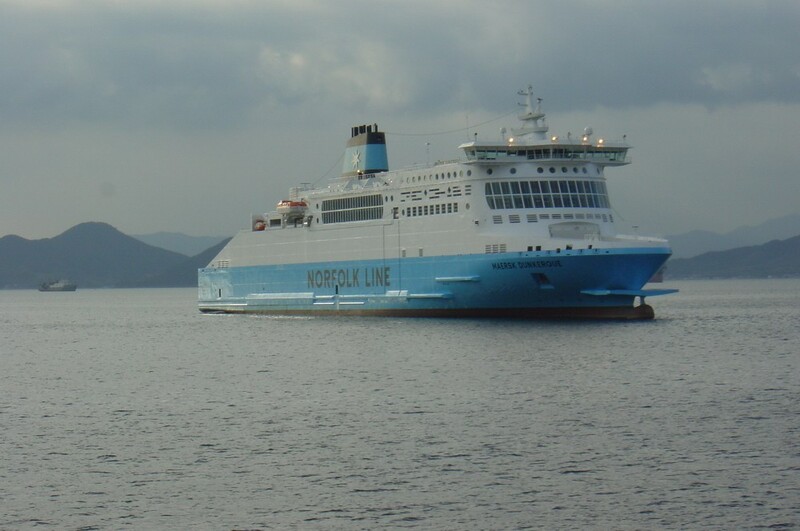 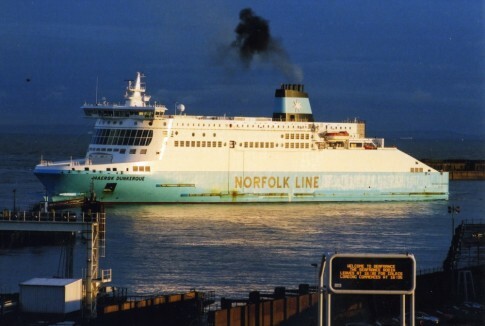 Certainly Norfolkline came into the market at the right time â€“ the Dover-Dunkerque operation was inaugurated with just one ship in March 2000 and with low expectations â€“ externally at least. A second ship was added in October of that year and the deployment of â€˜Dâ€™ class has enabled the expansion to continue apace. 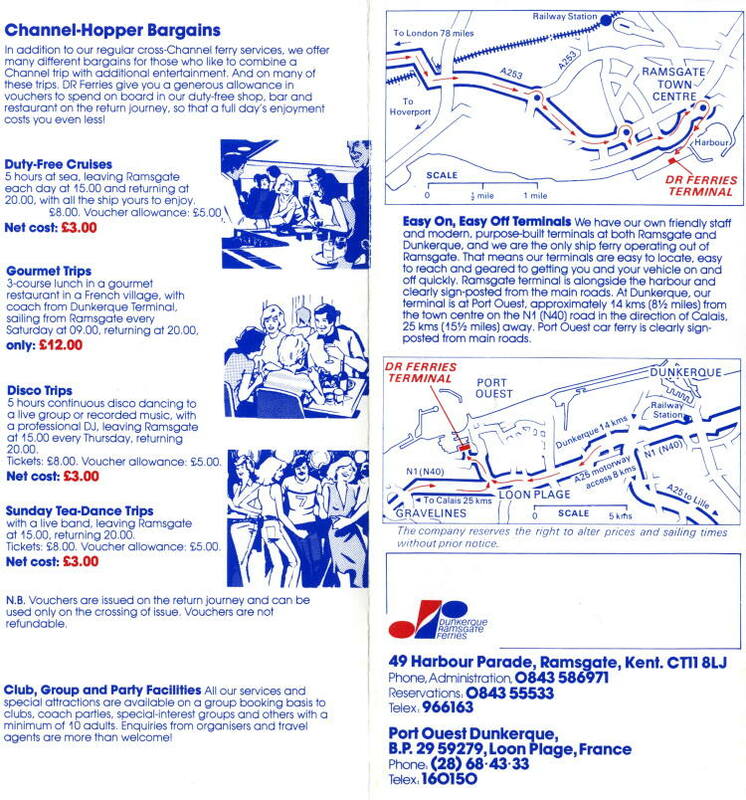 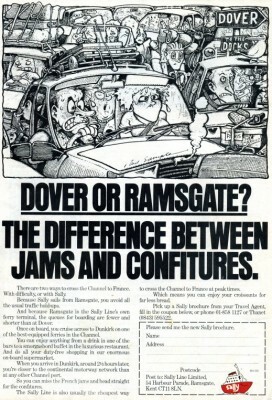 The fast growth of freight traffic through Dover in the late 1990s and past the turn of the century enabled a start-up with the right backing to gain a share of the market which, if small enough initially perhaps not to overly concern the established competition at a time of plenty, soon became a major rival. 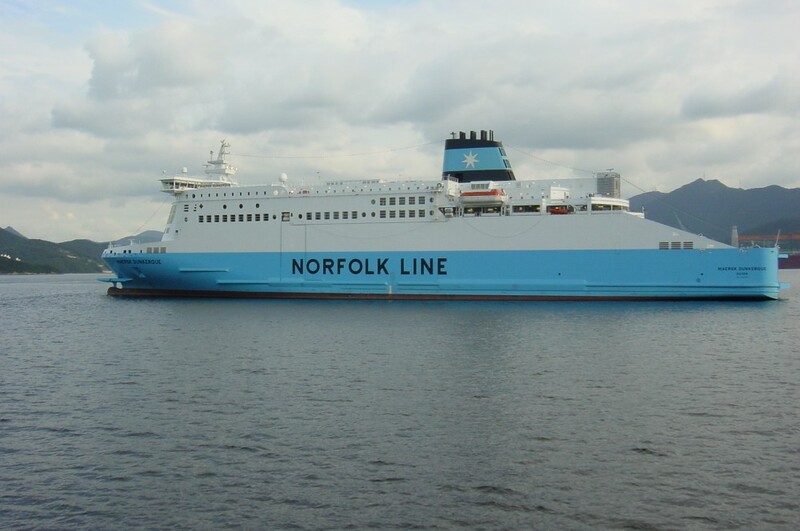 Aided by the new ships, Norfolkline’s passenger traffic has quadrupled since 2003, and freight has increased by over 75% from a base that was already fairly strong. 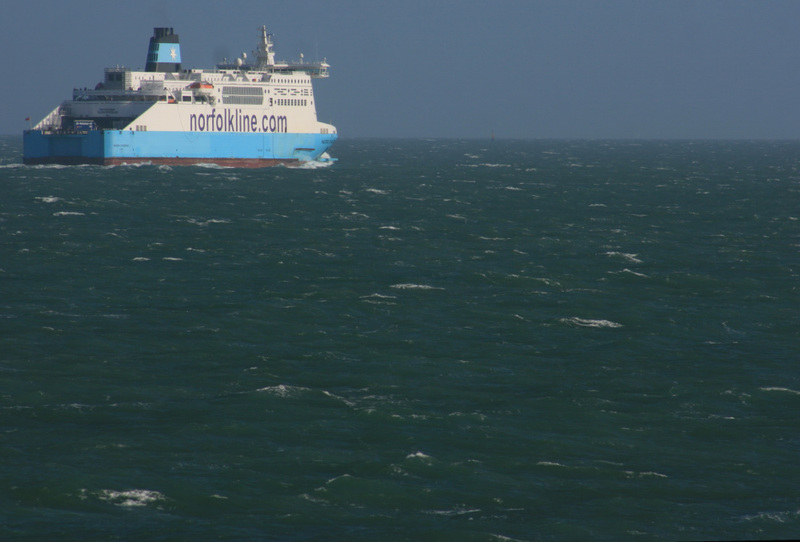 Indeed, the growth of the market and of ship size generally in recent years is demonstrated by Norfolkline, with a tenth of the sailings, in 2008 carrying over 75% of the total freight traffic that P&O and Sealink between them carried to Calais in 1995. 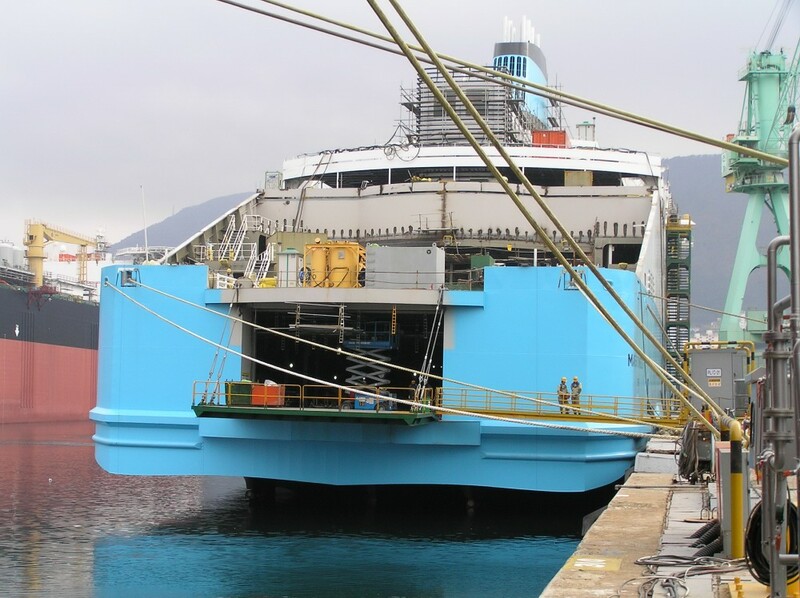 The Samsung yard offered a very competitive quote to Maersk as part of their continuing efforts to gain entry into the ferry market following a tentative and somewhat uncertain start with Minoan Lineâ€™s three â€˜Prometheusâ€™ class fast ro-paxes, which never entirely proved satisfactory for their owners and were all fairly speedily disposed of. 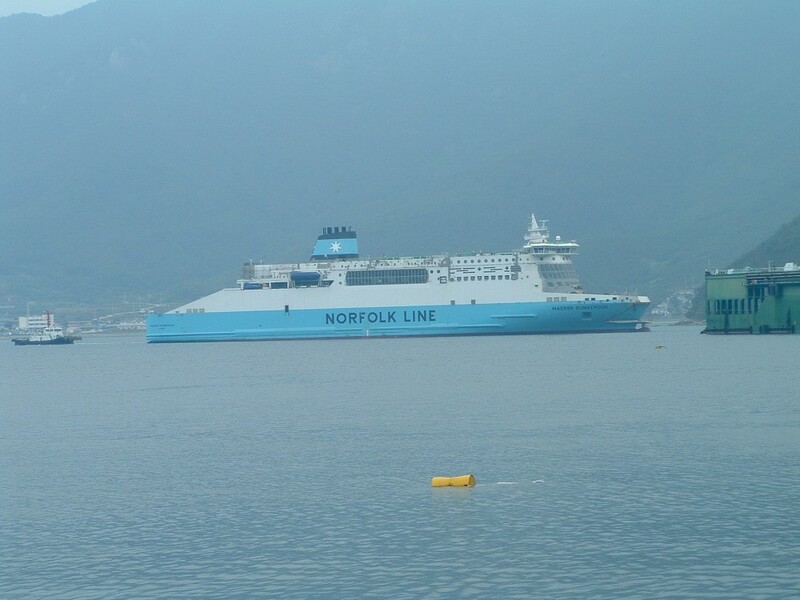 The Norfolkline ships were more carefully thought out at a concept level however (Minoan almost seemed to feel obliged to order just to keep up with their rivals) and have proven rather more successful, although question marks remain over the shipyardâ€™s ferry division which has not delivered a further ship since the Maersk Dover. 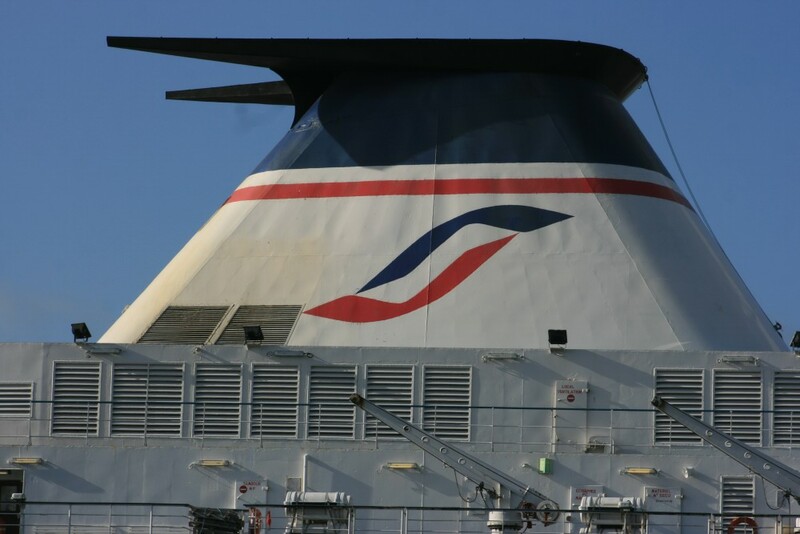 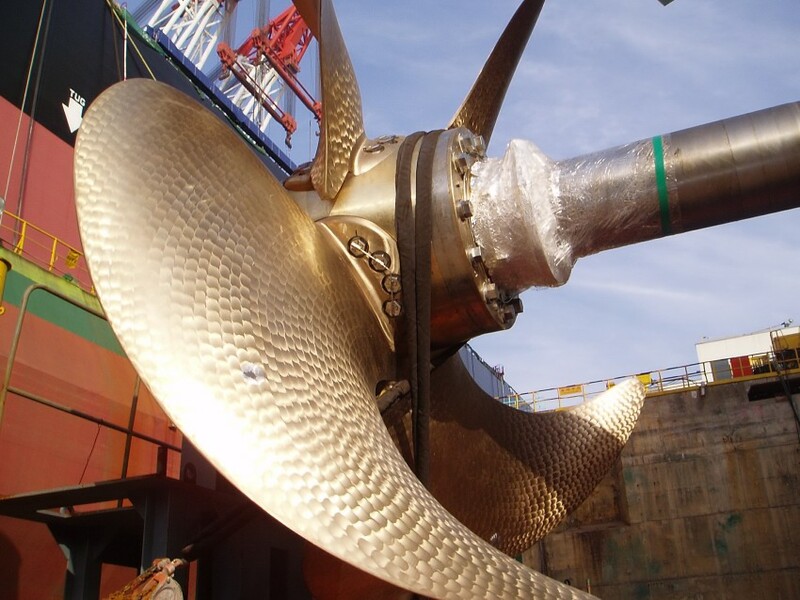 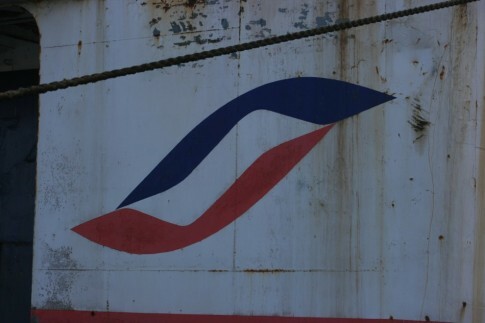 A pair of large ro-ro vessels for Stena are on order however and the results of dealing with this particularly demanding buyer remain to be seen; as with Maersk however Stena has previous experience having worked with Samsung on non-ferry projects. 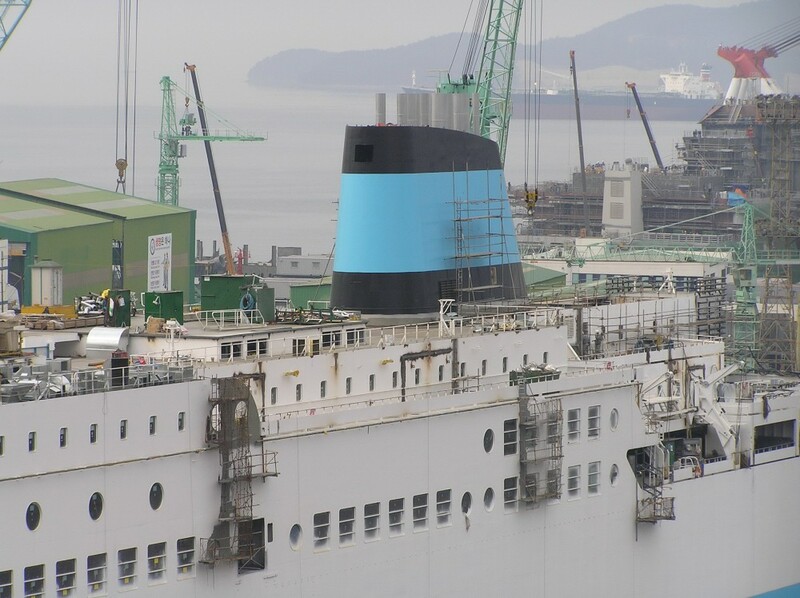 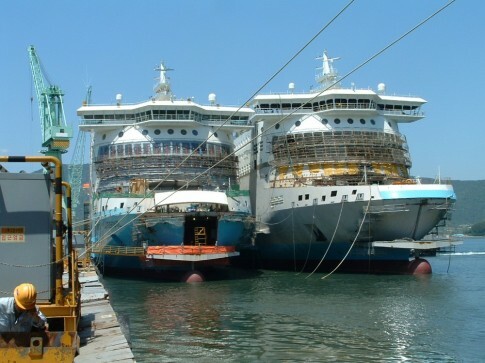 It is now nearly four years since the introduction of the Maersk Dunkerque and in the first of a series of fascinating pictures from behind the scenes at the shipyard in South Korea, reproduced here with grateful thanks to Stephen Mackenzie at Norfolkline, show the three ships under construction, from pre-fabricated blocks to recognisable ferries. 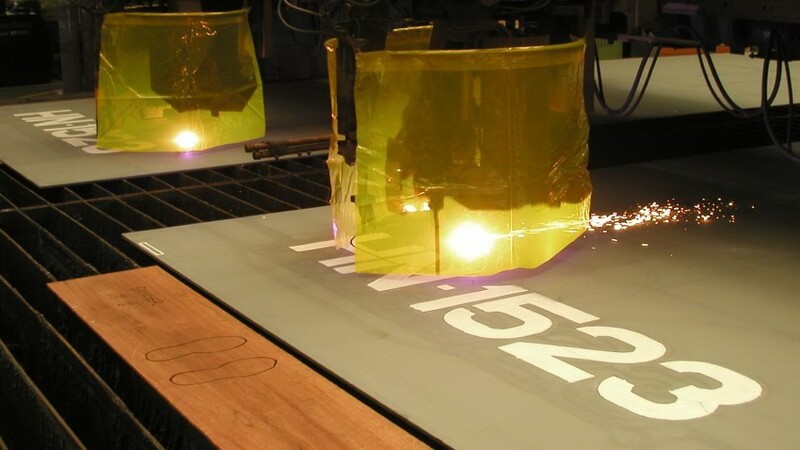 Cutting steel for yard number 1523 - the Maersk Dunkerque. 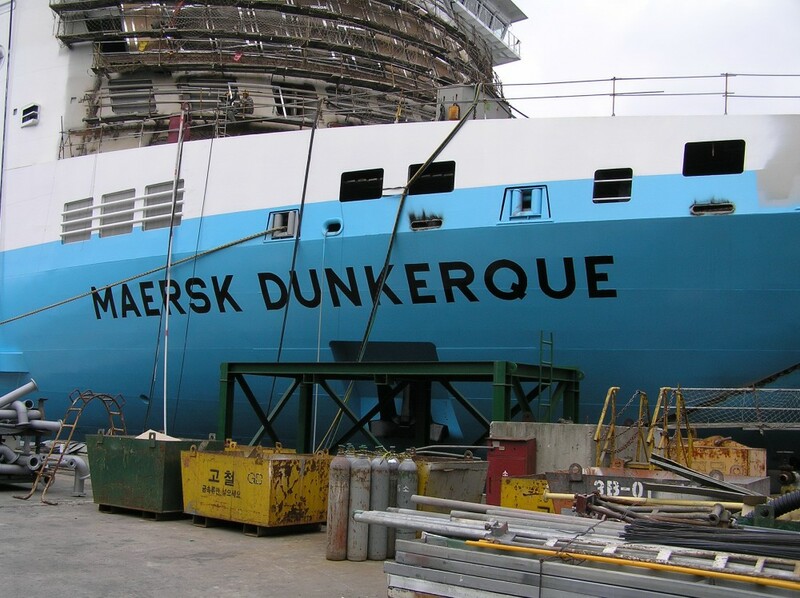 Timetable for completion of the Maersk Dunkerque. An overall view of the yard. A close up of the bridge section. 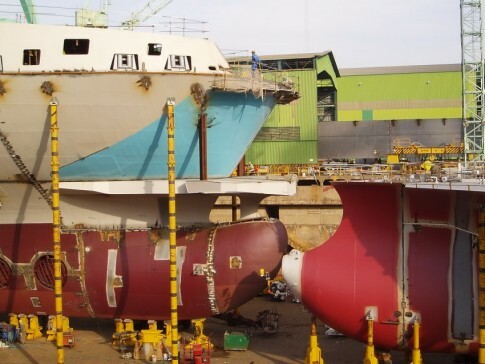 With the 'Dunkerque' half complete, work on the 'Delft' gets underway (right). The bow thrust units now safely in place. 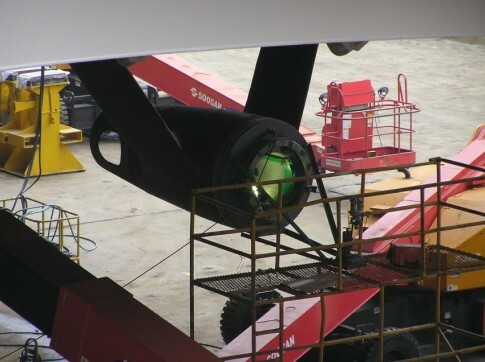 Propellor shaft installation in progress. 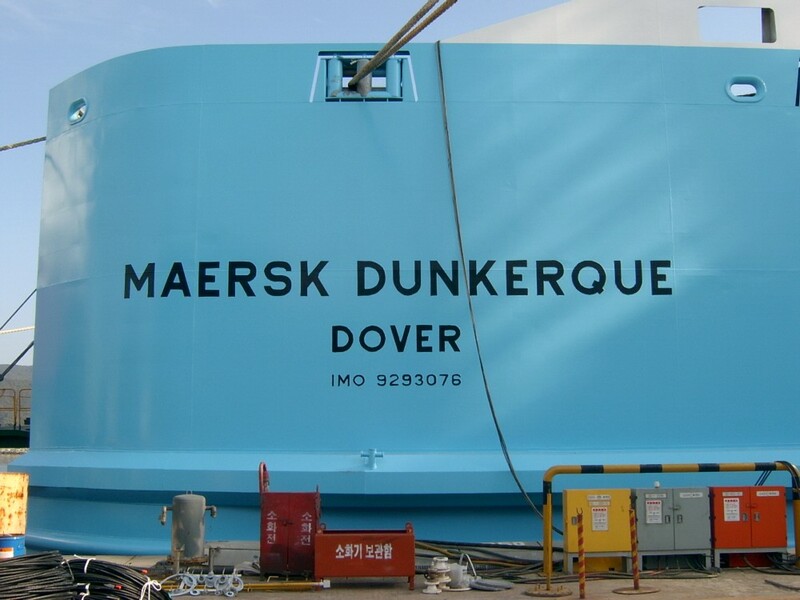 The stern of the Maersk Dunkerque, before the addition of the aft superstructure. 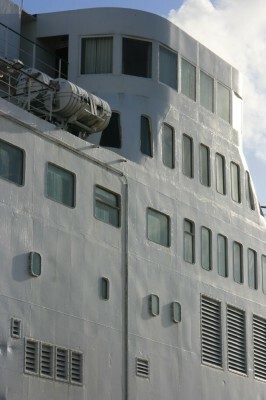 The towering forward superstructure for one of the second pair, with its distinctive window shapes. 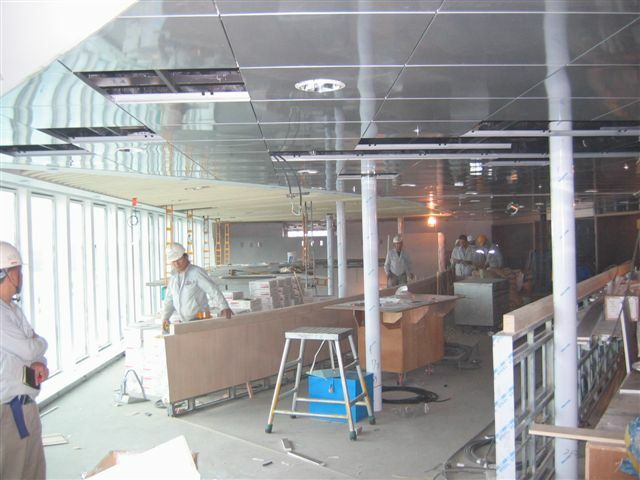 The twin-level window structure on the starboard side will later enclose The Lounge cafe bar and La Veranda bistro. 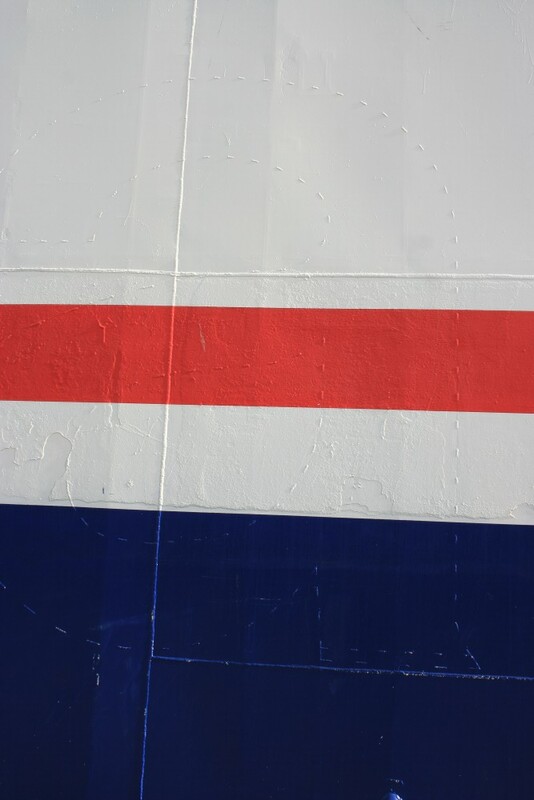 Stern section complete with rudder. 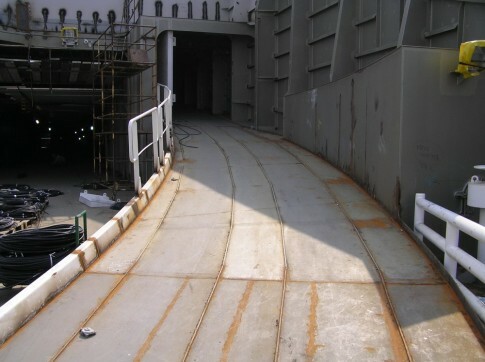 A complete bow section, including 'cow catcher' for use at Dunkerque's new linkspan. 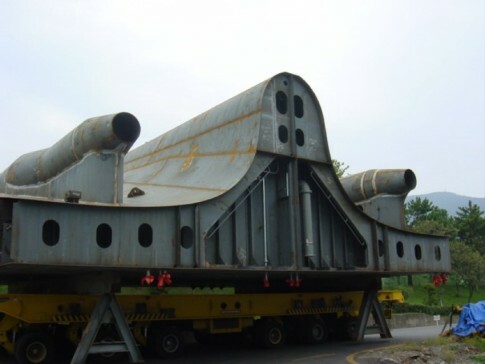 More prefabricated pieces on the move. 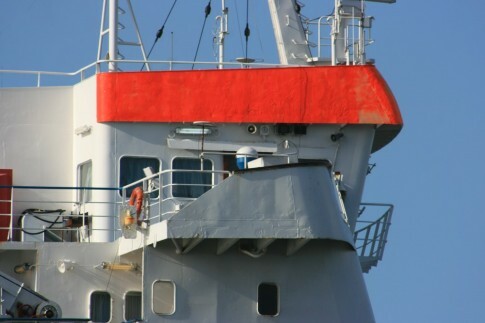 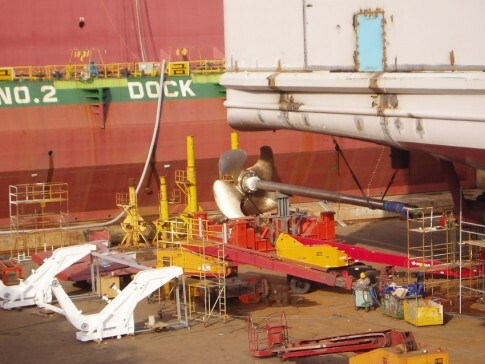 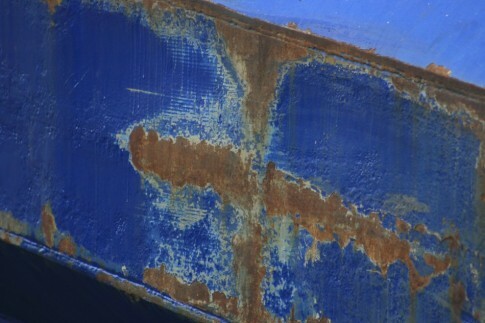 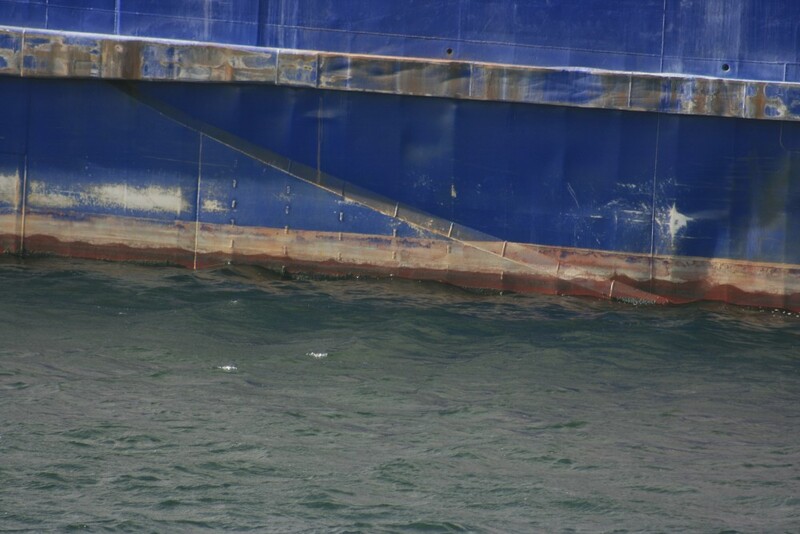 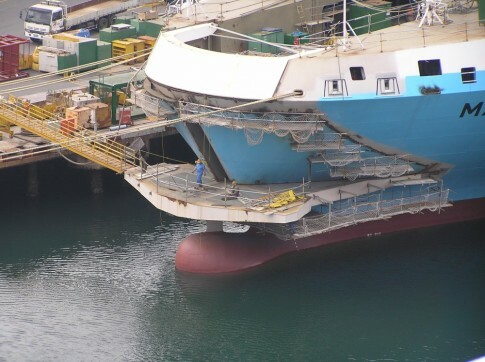 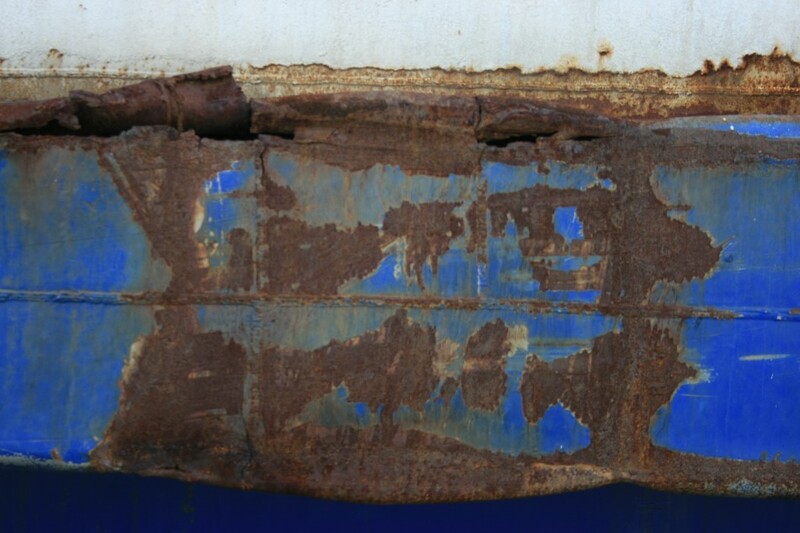 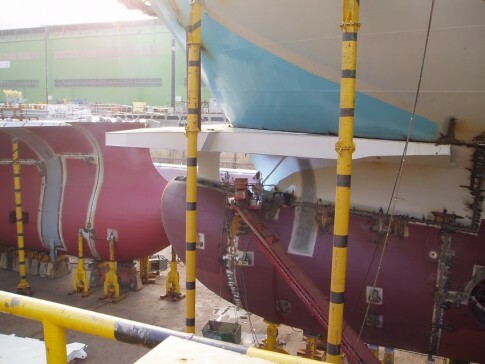 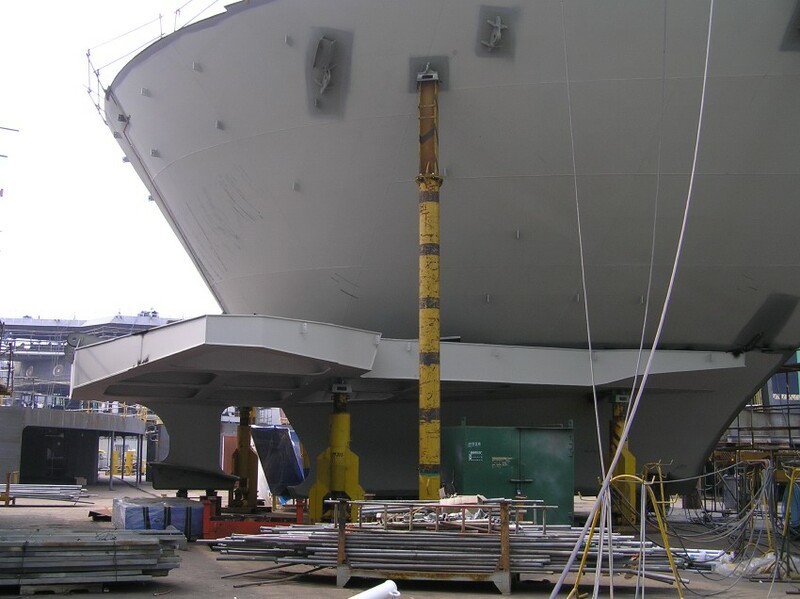 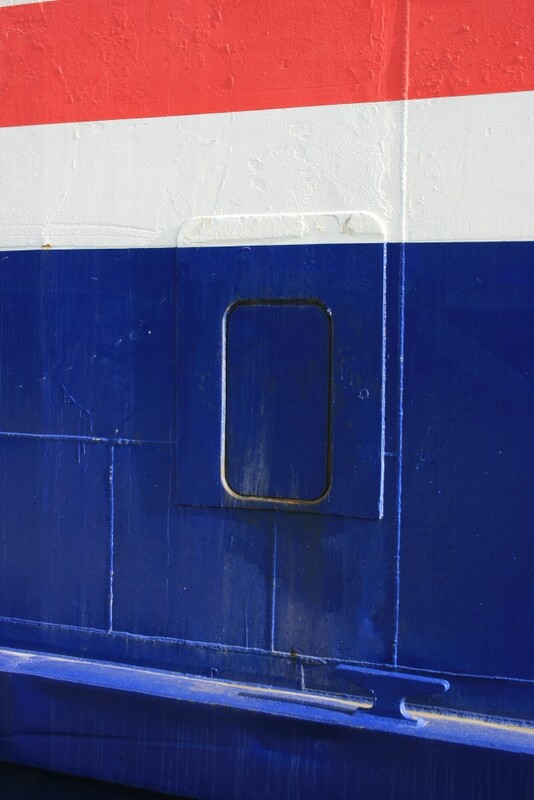 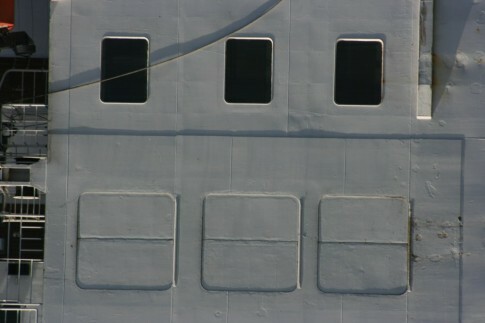 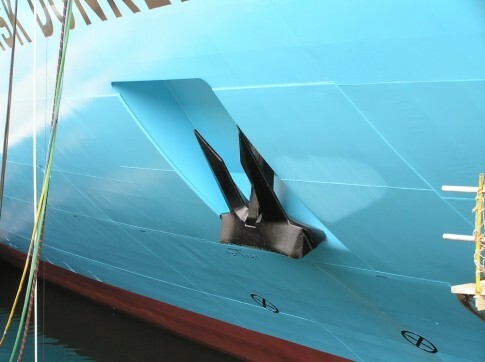 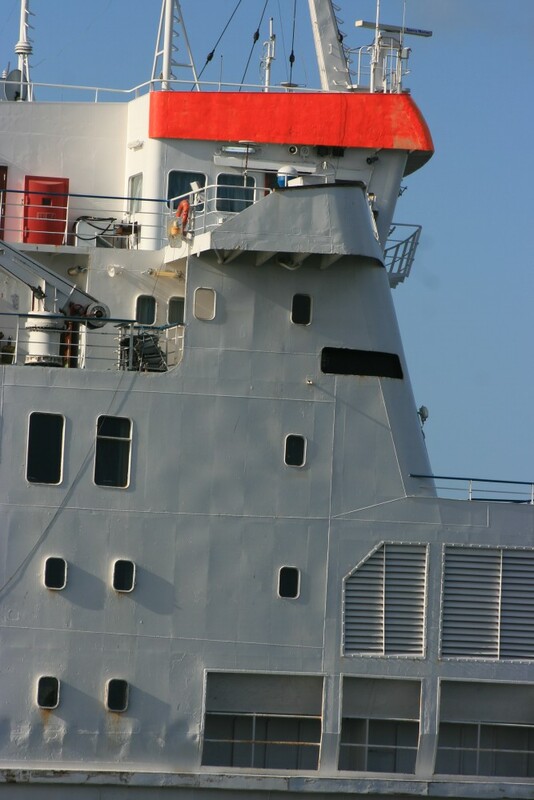 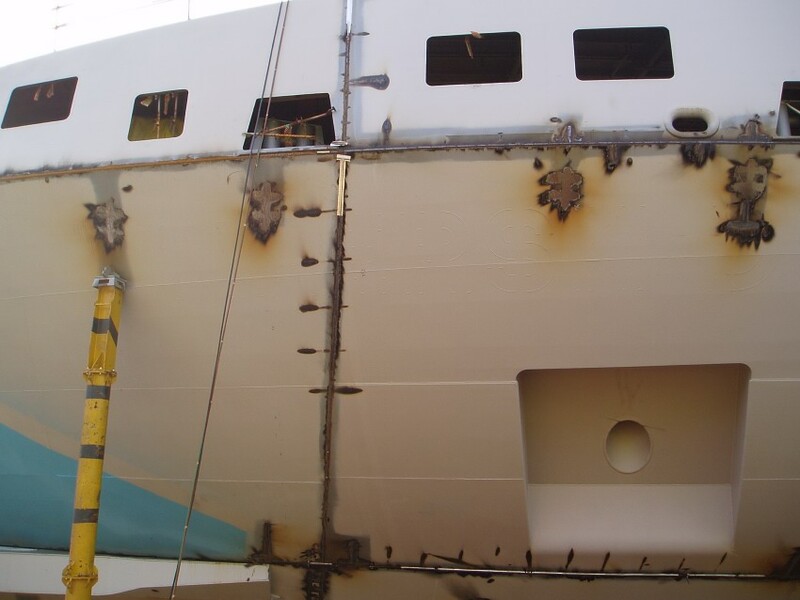 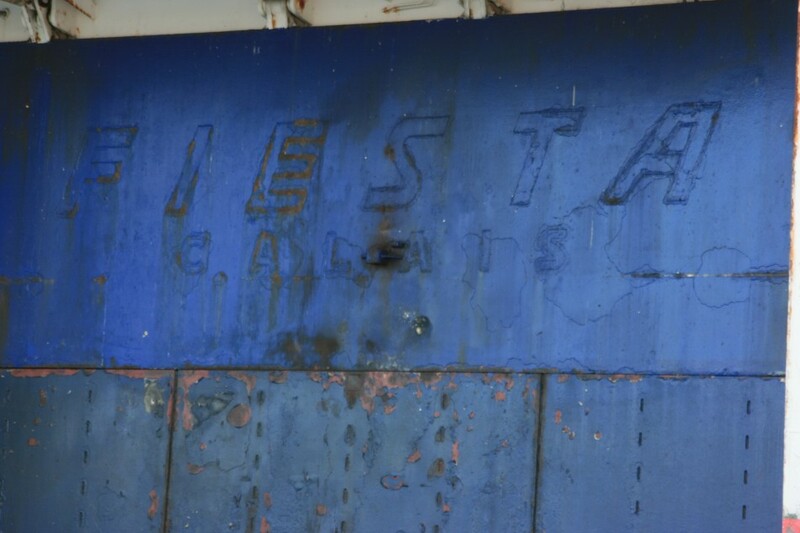 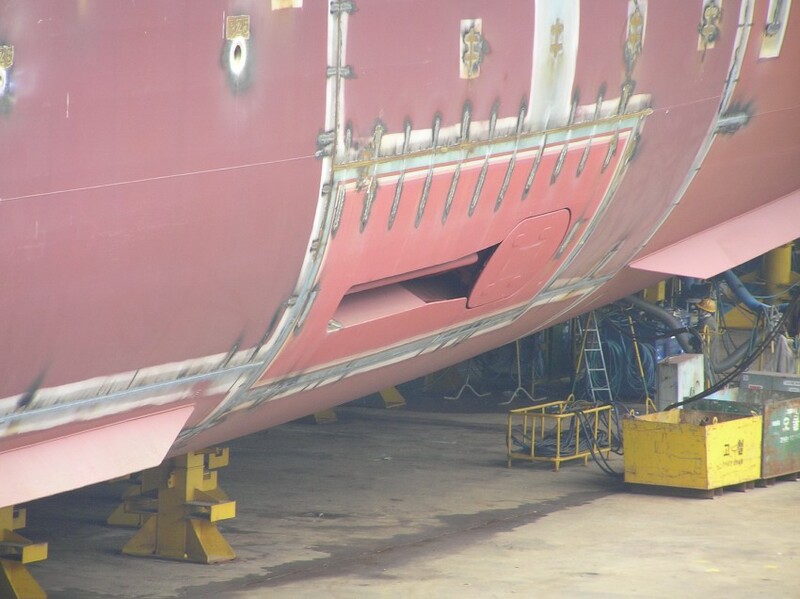 Maersk Delft's starboard stabiliser slot. 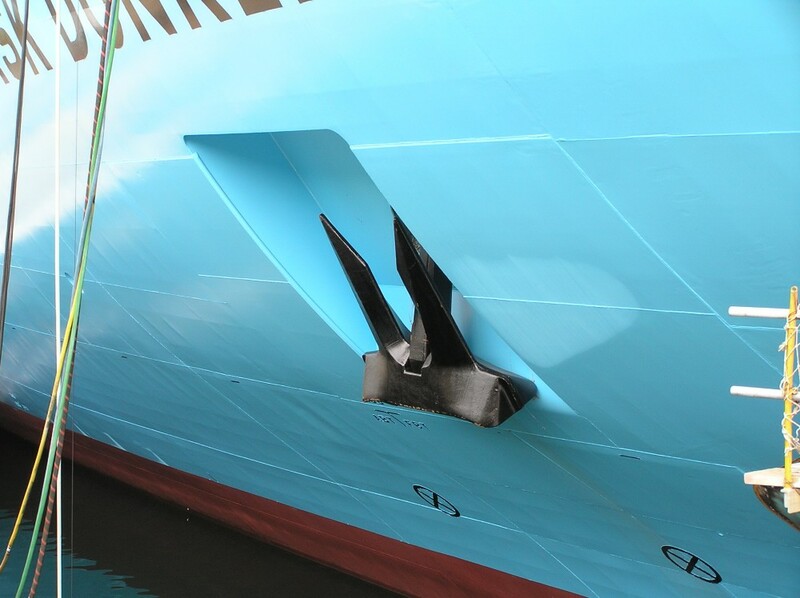 At the stern of the Maersk Delft. 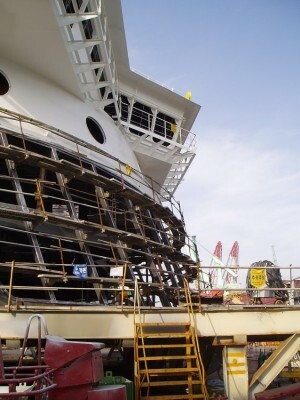 The view forward, with the Maersk Dover being assembled in the background. 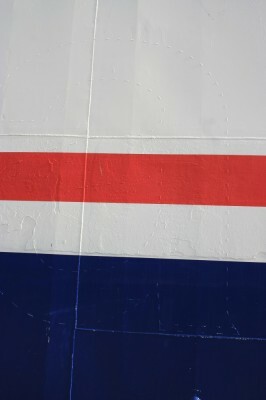 The second in the series of photographs, coming shortly, will cover the completion and handover of the Maersk Dunkerque. 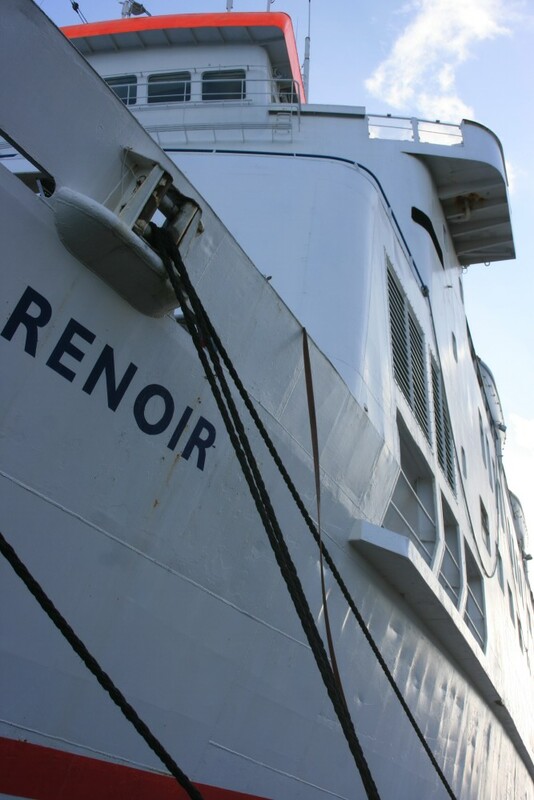 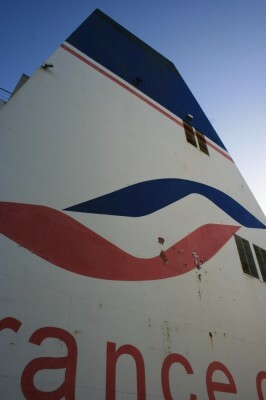 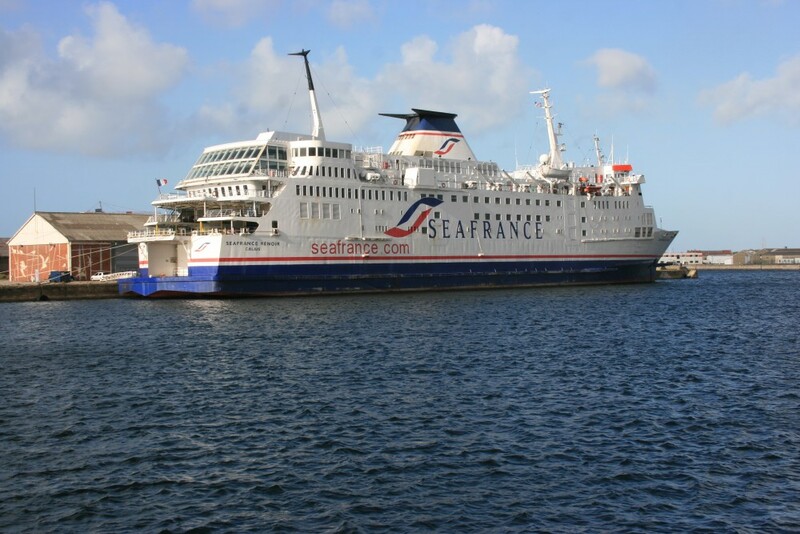 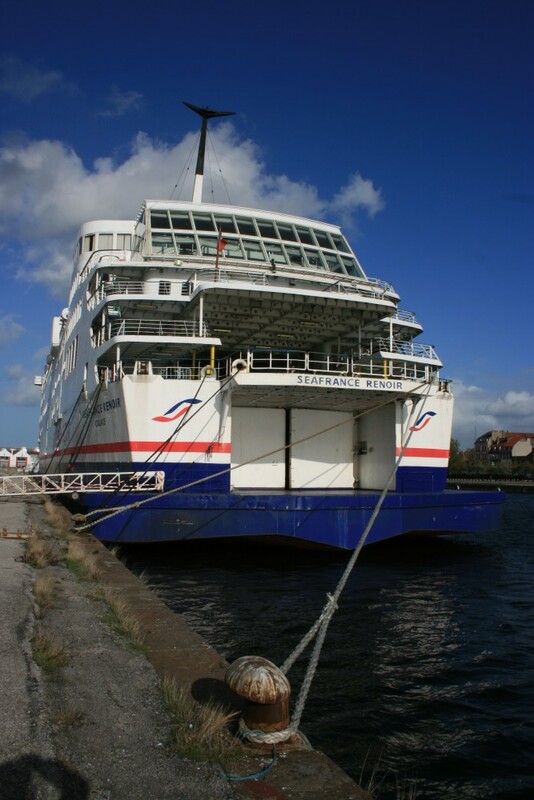 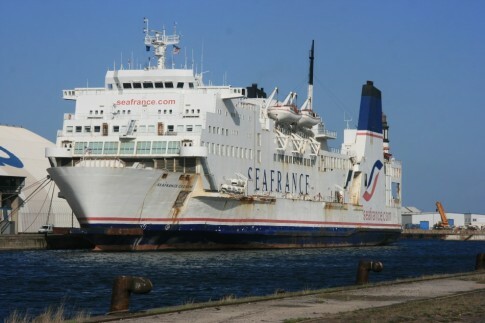 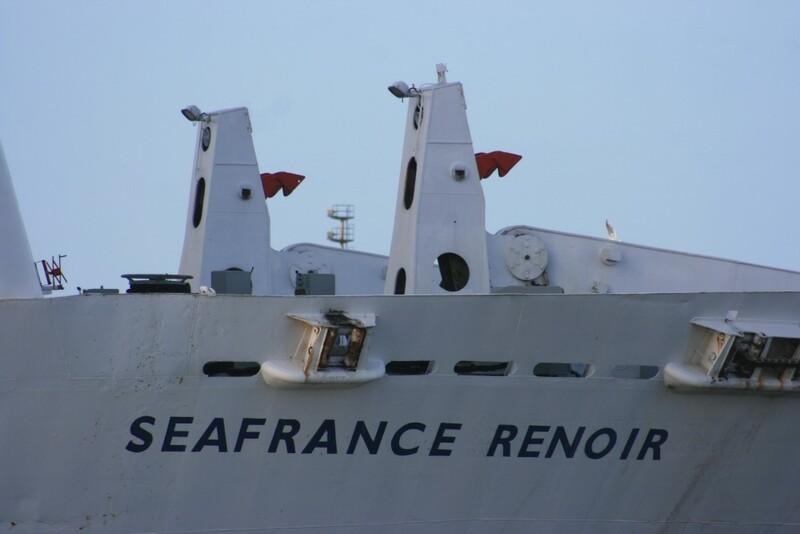 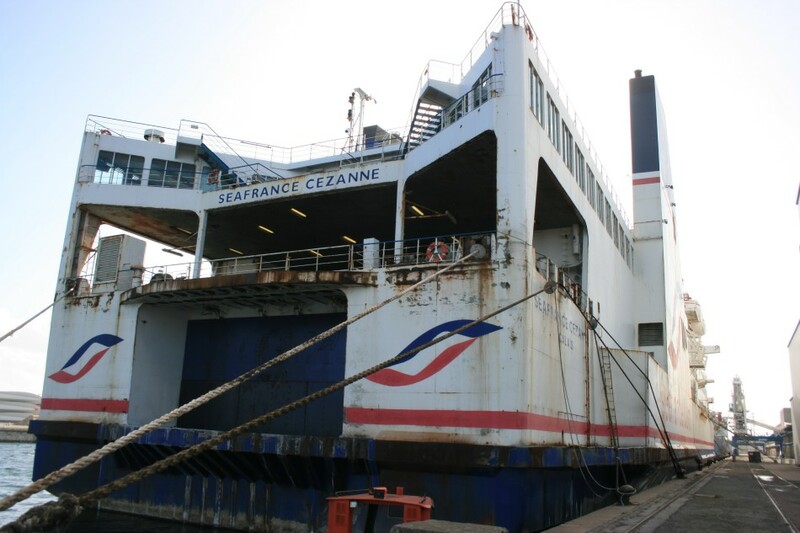 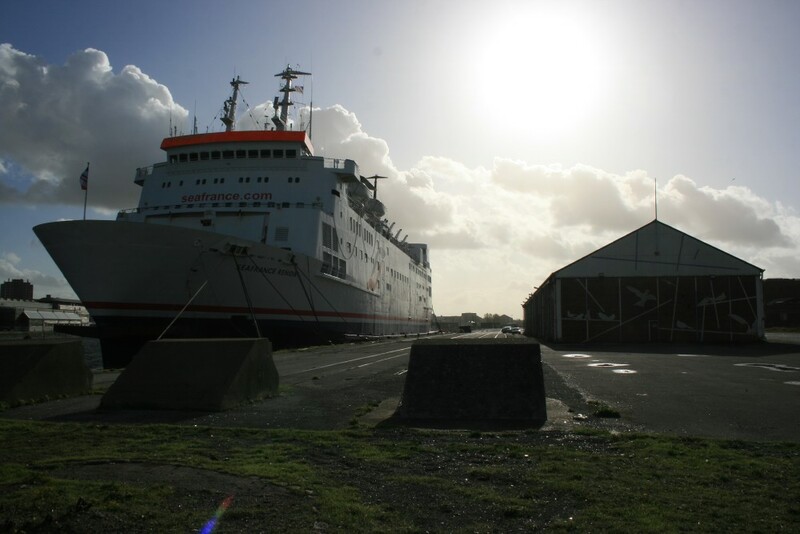 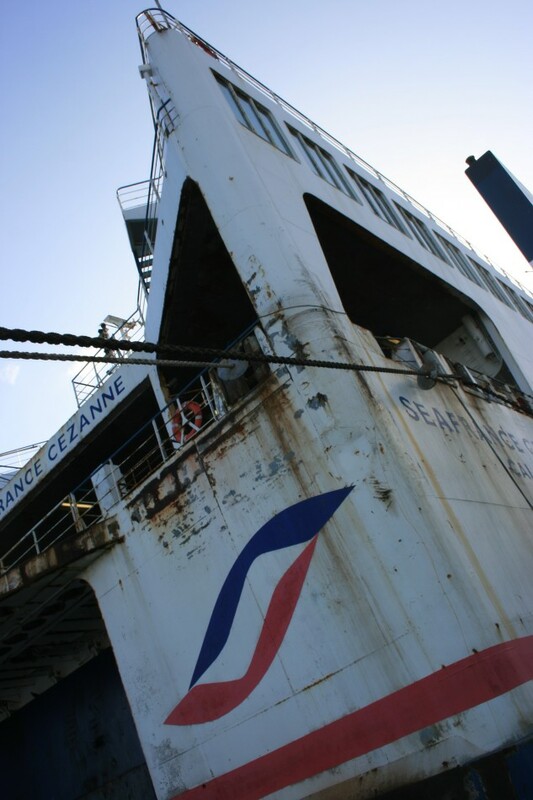 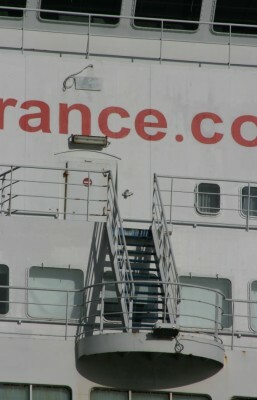 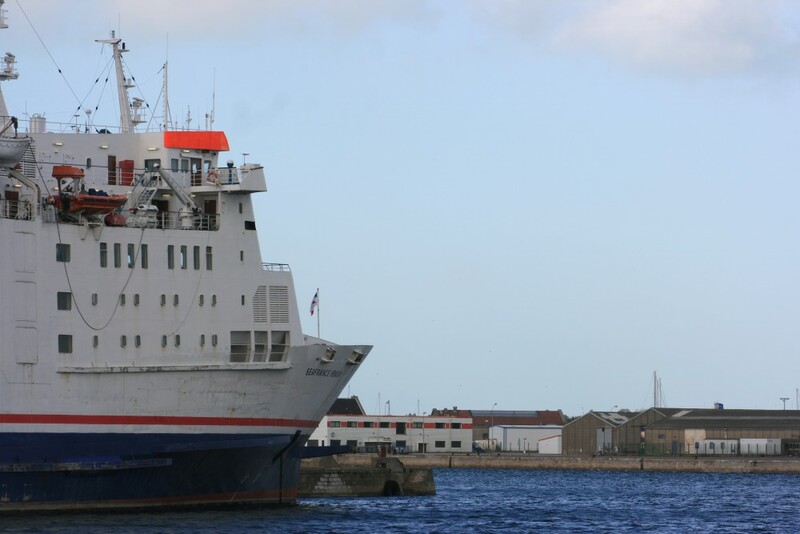 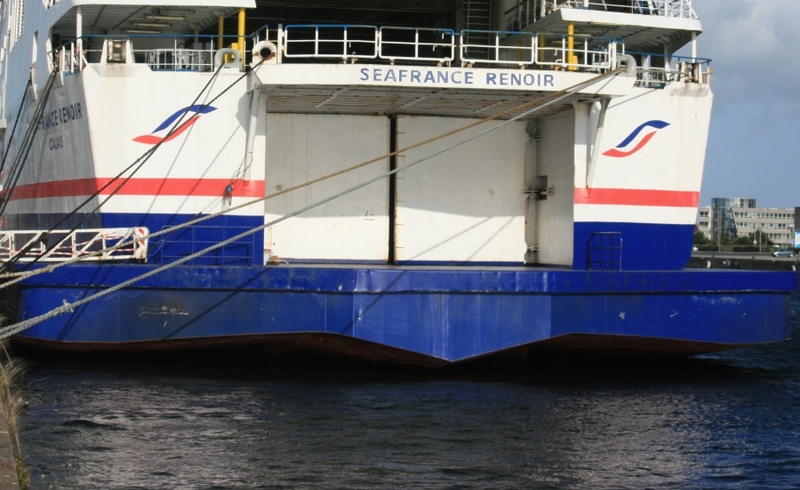 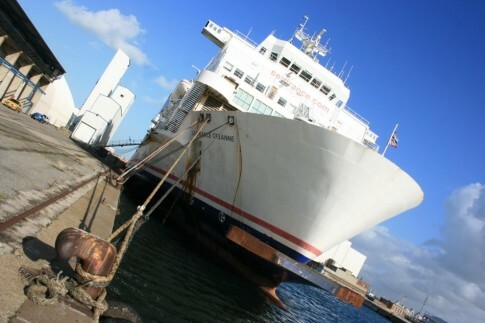 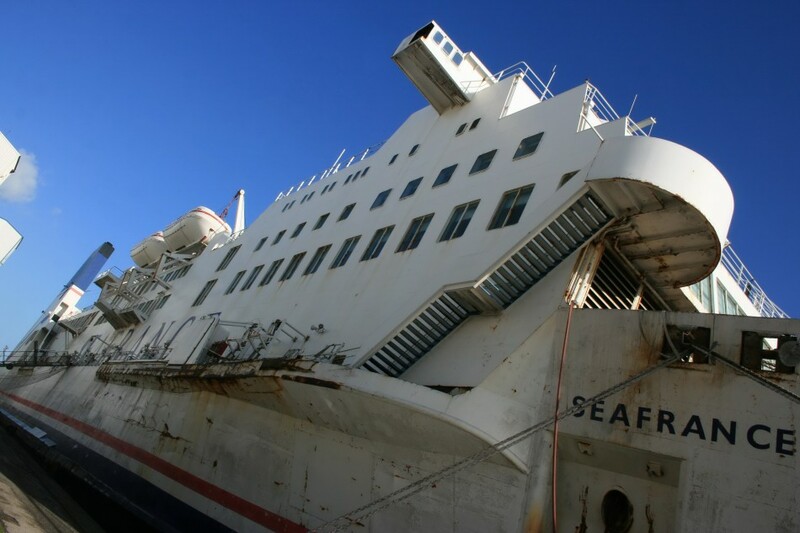 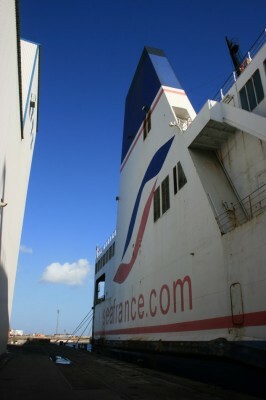 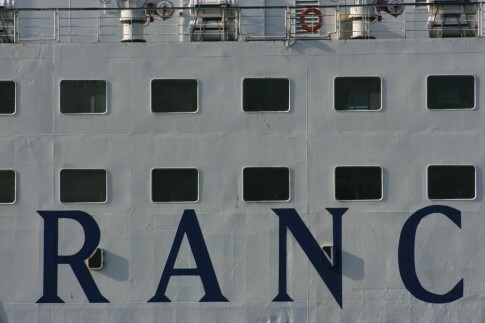 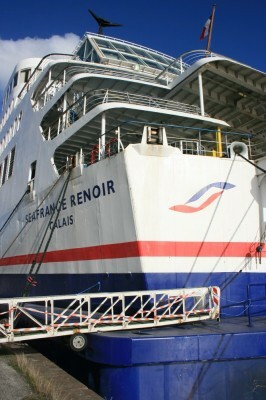 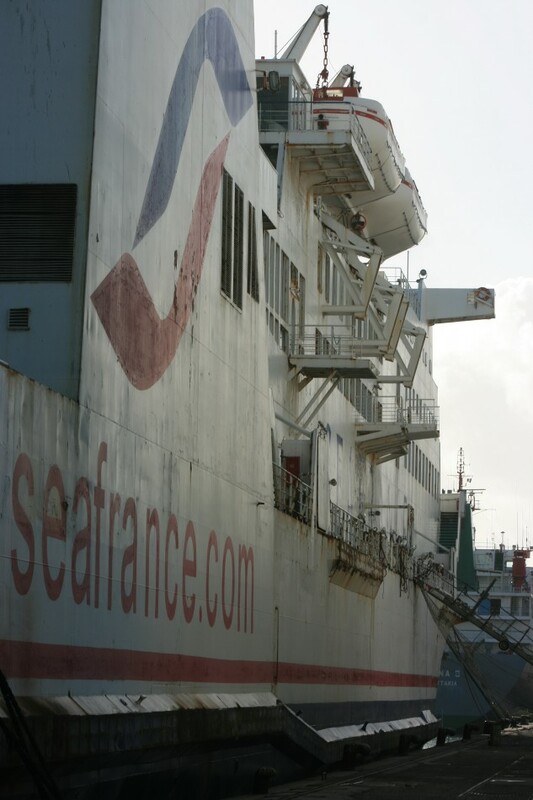 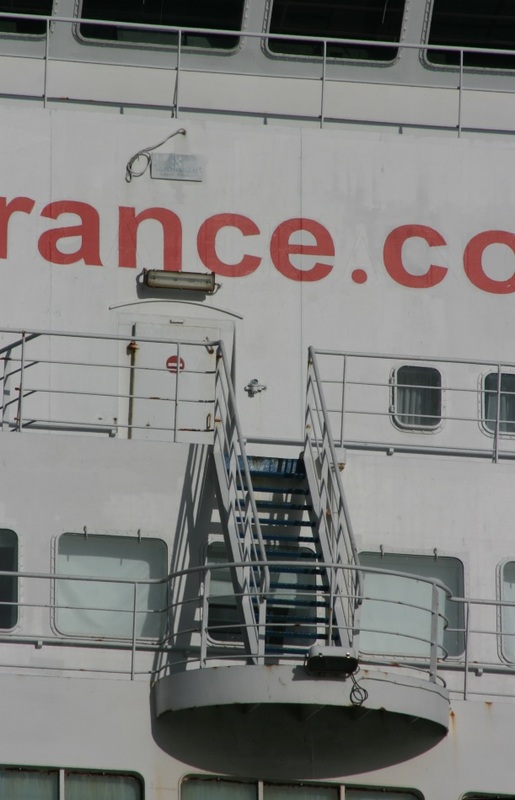 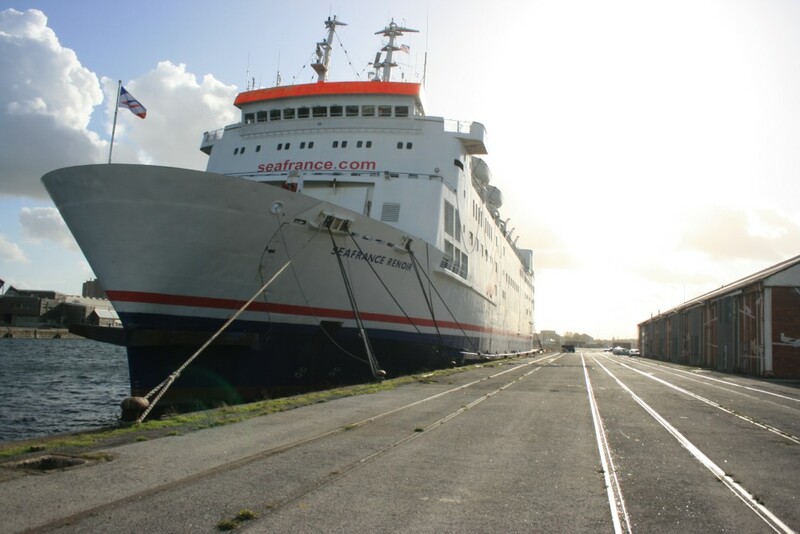 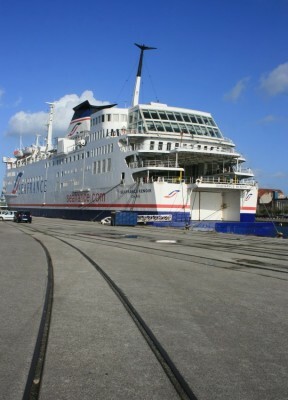 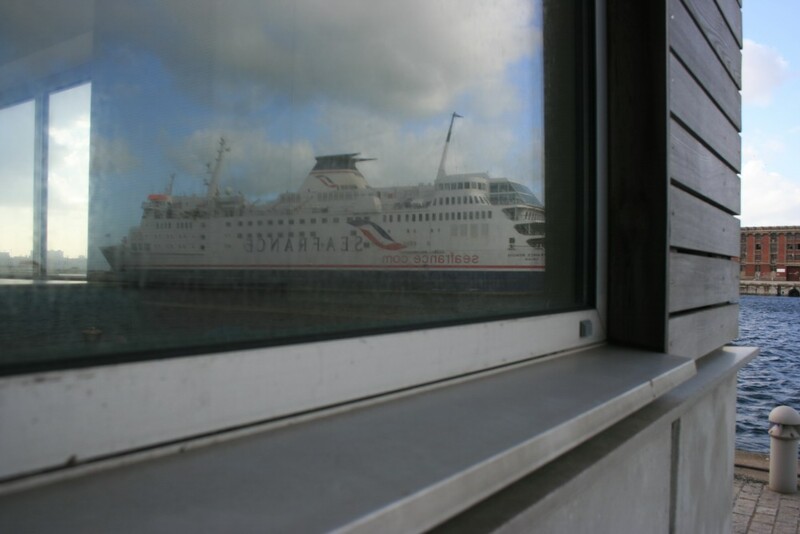 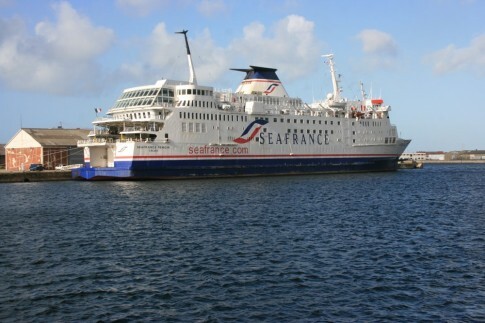 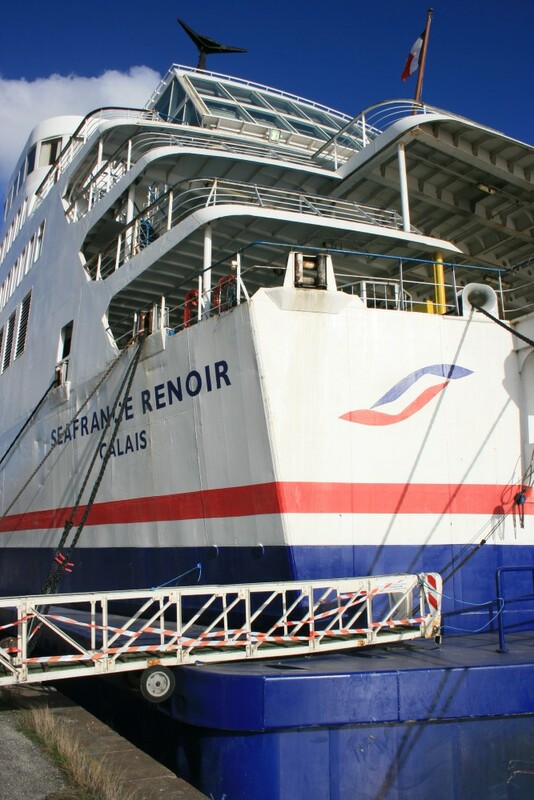 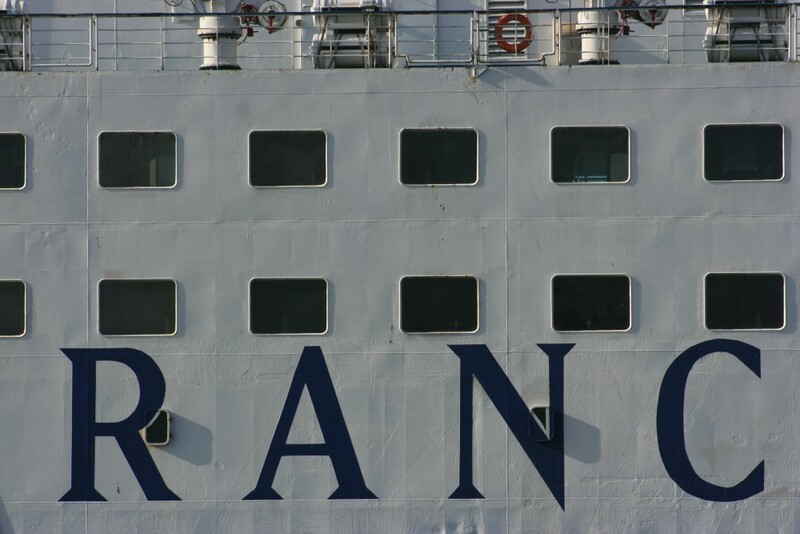 The car ferry port of Ramsgate first saw operation in 1980 when a new company, Dunkerque-Ramsgate Ferries, backed by the founder of Olau Line Ole Lauritzen, operated the former CGT/SNCM ferry Fred Scamaroni as the Nuits Saint Georges. 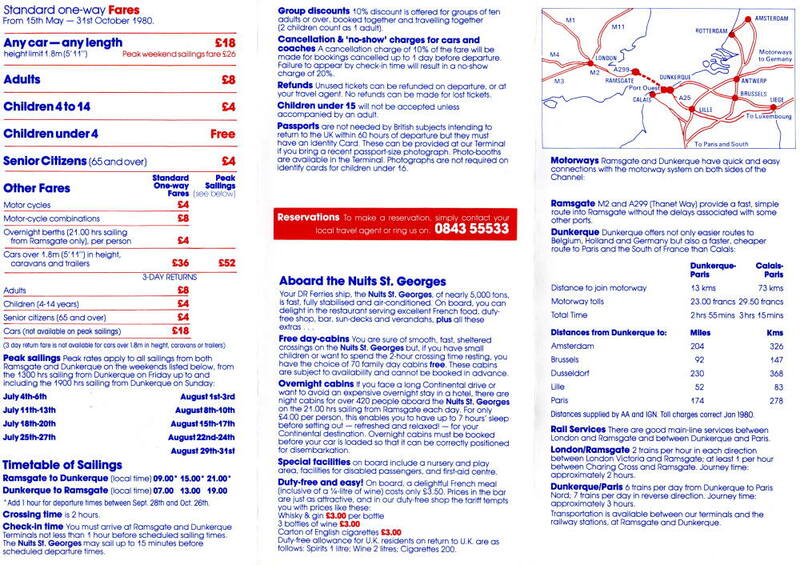 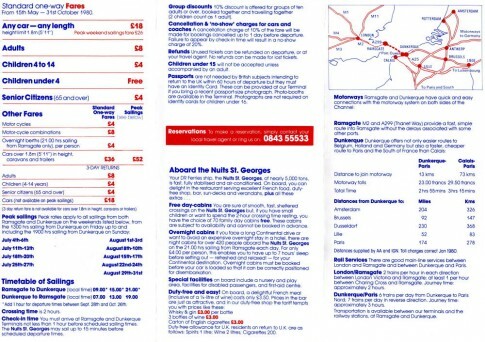 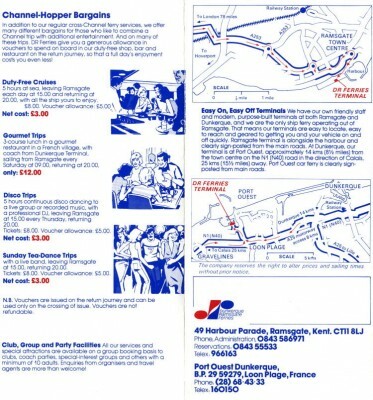 ‘Sunday Tea-Dance Trips’ (Â£8 again). 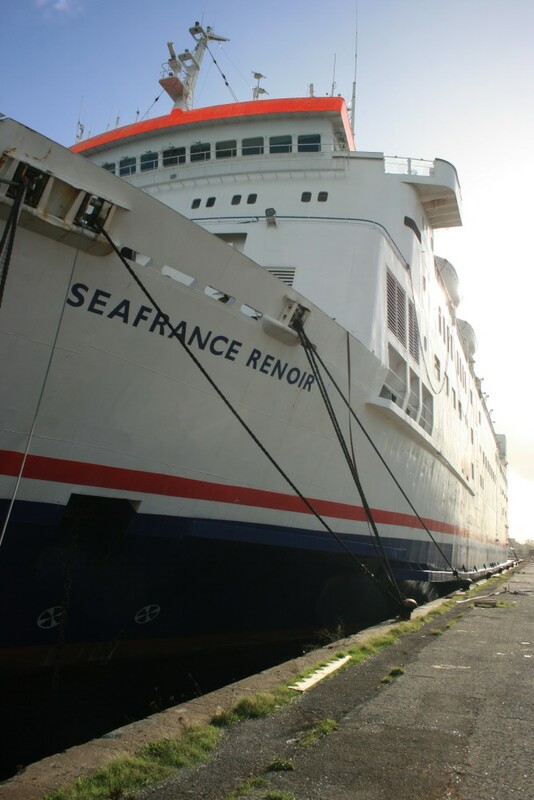 However, with Ramsgate not entirely ready for such an operation at that stage and the ship not entirely suitable, the service ended in failure with the Nuits Saint Georges ultimately arrested due to unpaid debts. 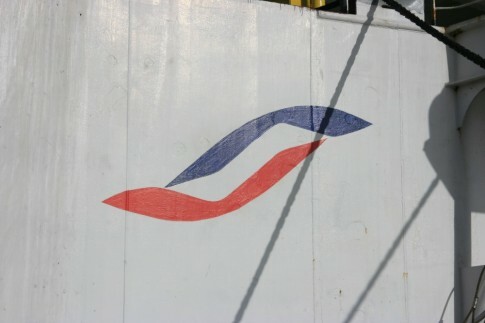 Despite this failure, Ramsgate’s potential was recognised by Finnish shipowners Rederi AB Sally, the most expansion-minded of Viking Line’s three founder companies. With spare tonnage available from their core operations, the Viking 5, last of the Viking Line ‘Papenburgers’, was renamed The Viking and deployed on the same route which operated under the brand name Sally The Viking Line. 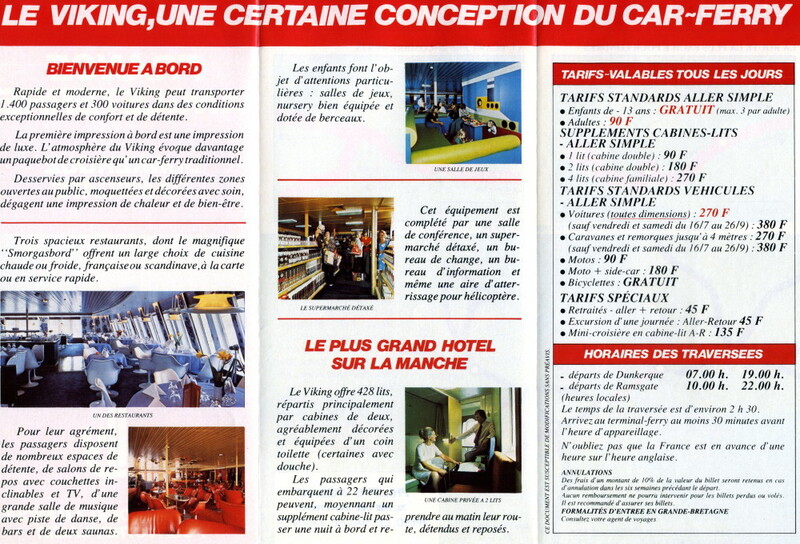 Shown here is the French brochure for that initial season, which was interrupted by a serious engine room explosion on board the ship in August. 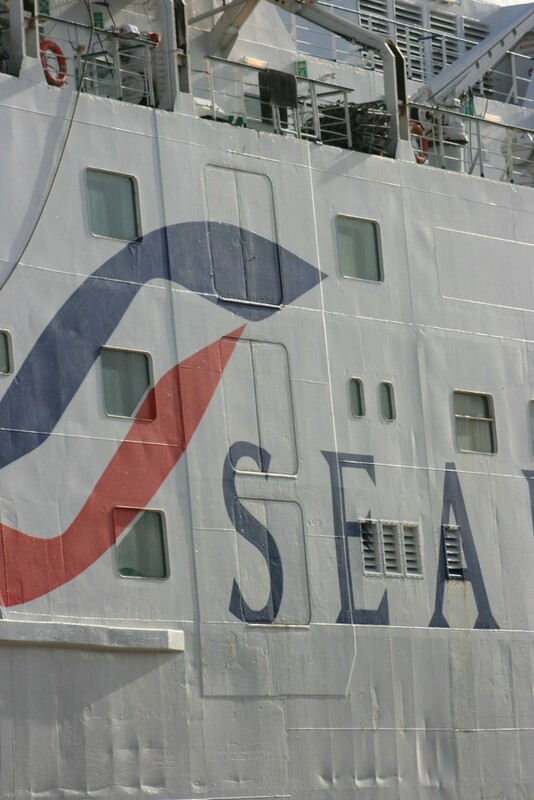 That did not prevent the service’s success however and Sally would become a familiar name on the English Channel for the next 17 years. 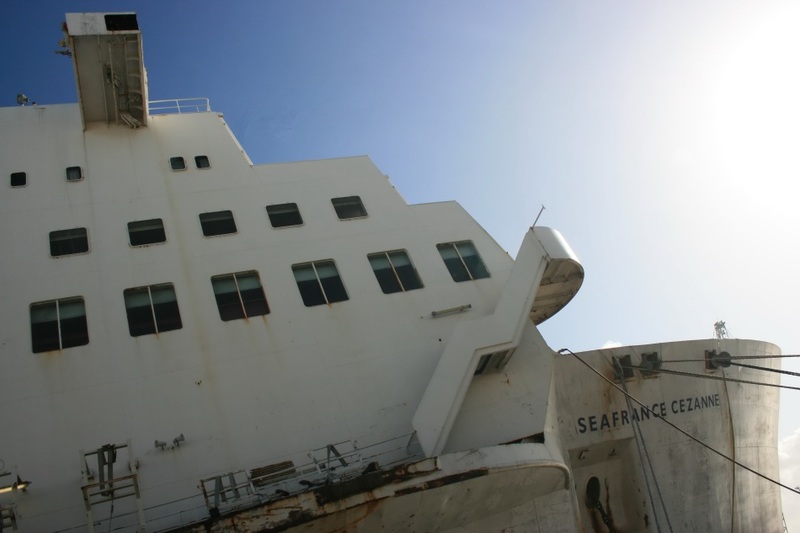 The two ships shown have met with different fates – the Nuits Saint Georges never sailed for another European operator and was sold to Egyptian owners. Operating under the name Salem Express she was lost when sailing between Jeddah and Suez in 1991 with the loss of, officially, 470 lives. 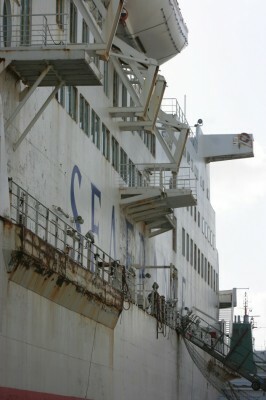 The wreck today remains, and a video of a dive on it can be seen here. 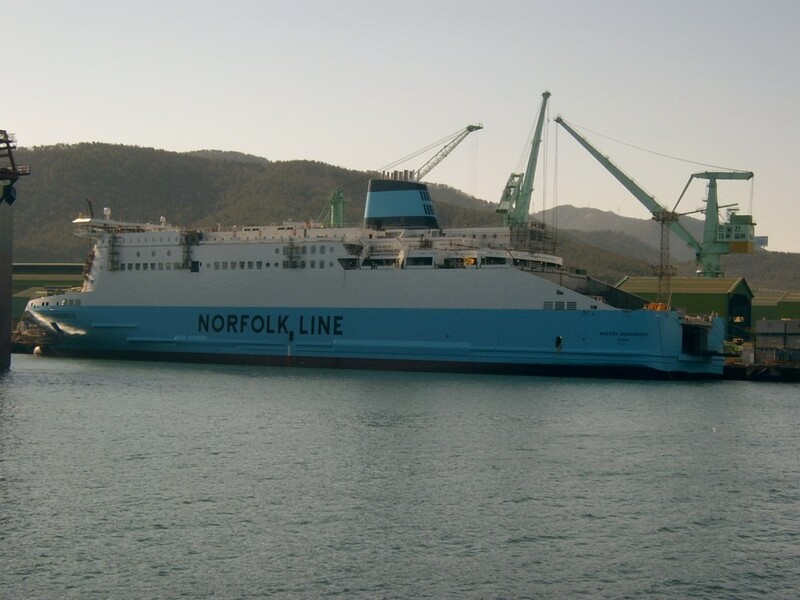 Sally’s first The Viking ultimately passed to COMARIT in 1988 and has sailed for the company ever since between Algeciras in Spain and Tangier in Morocco as the Boughaz.